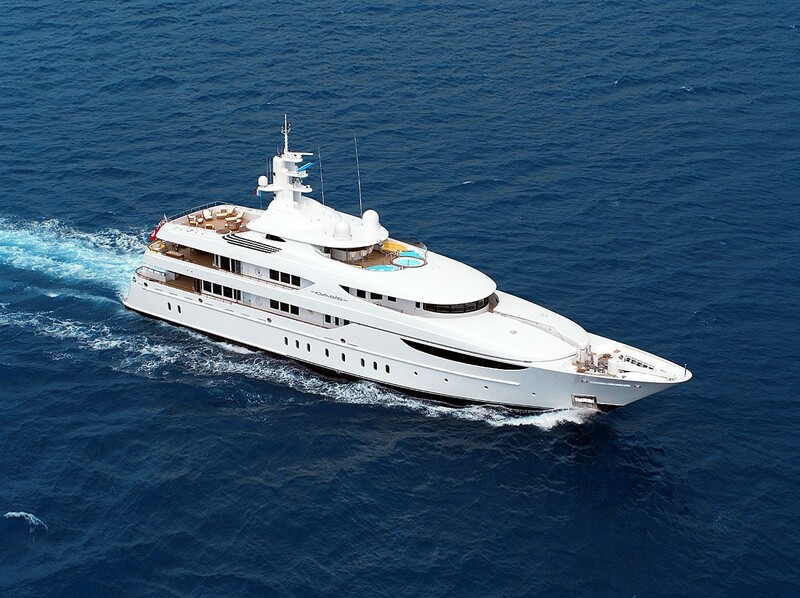 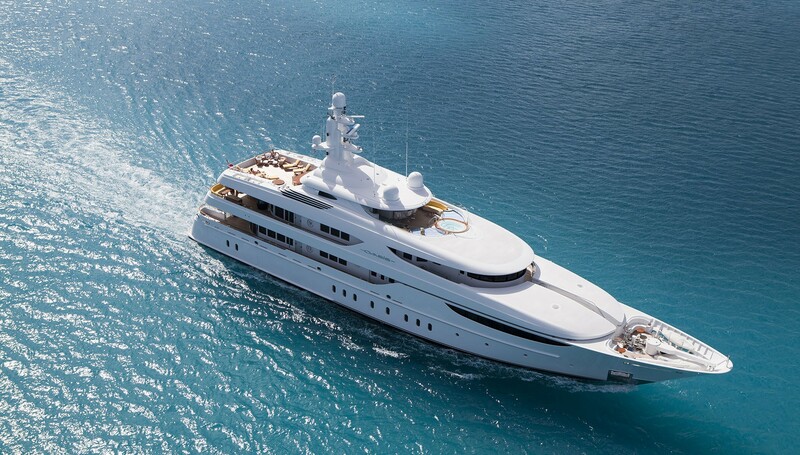 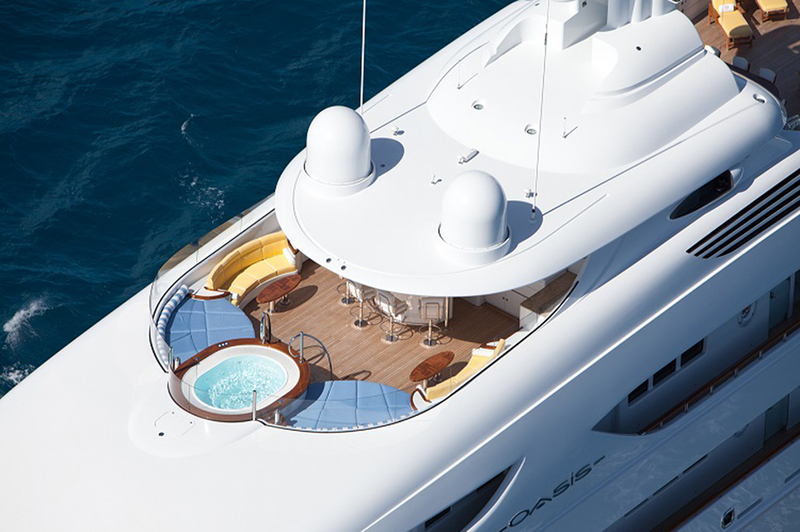 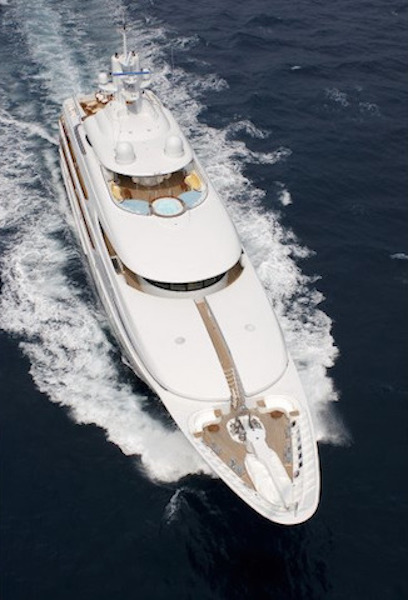 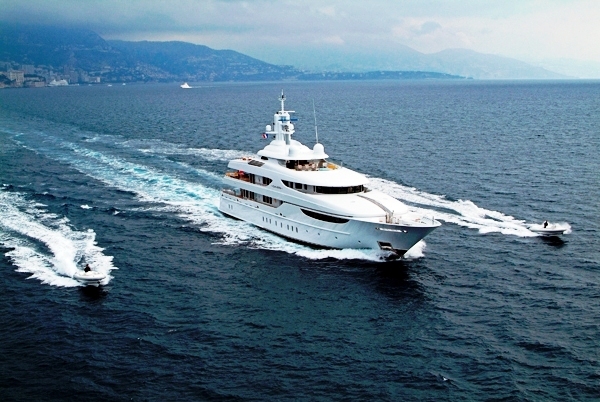 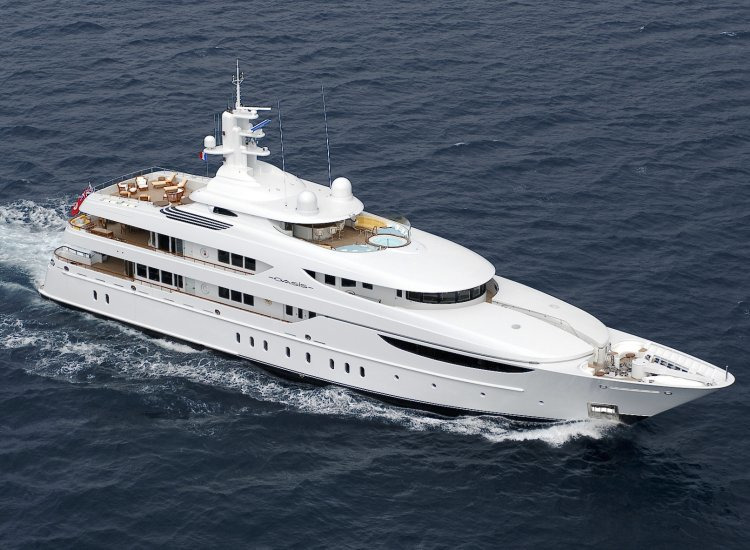 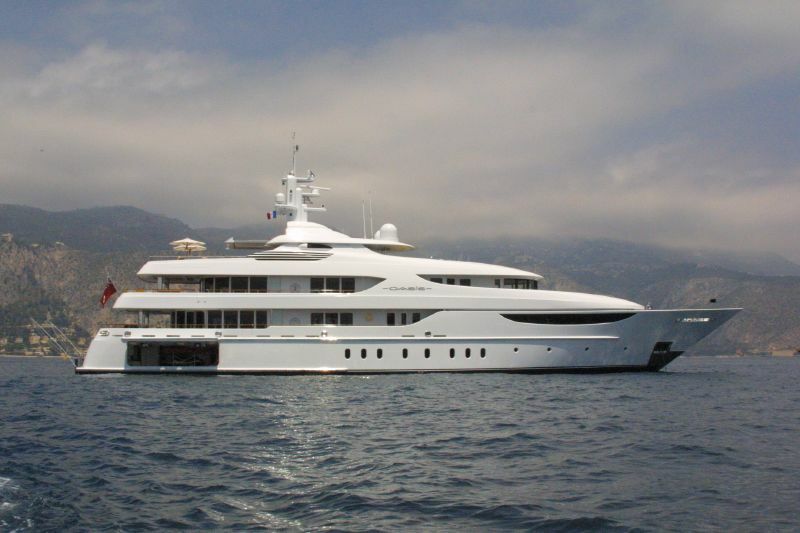 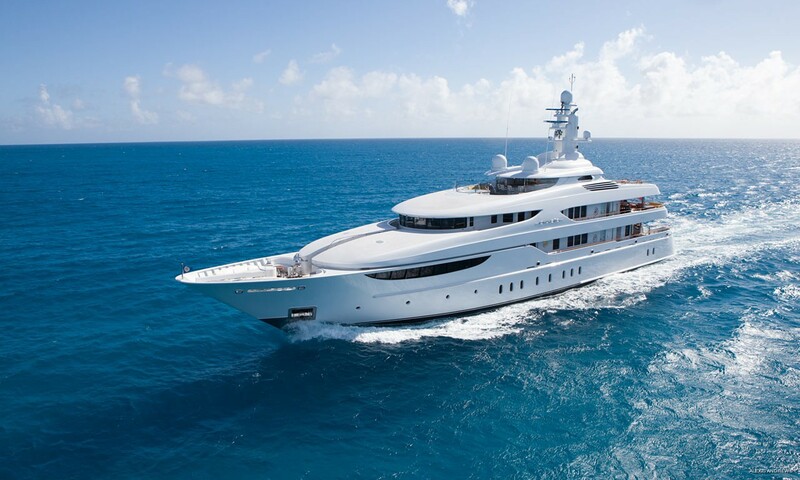 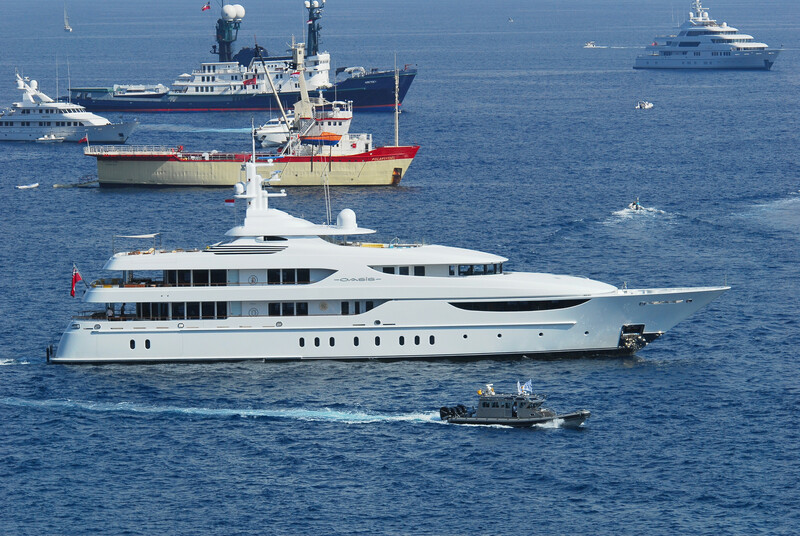 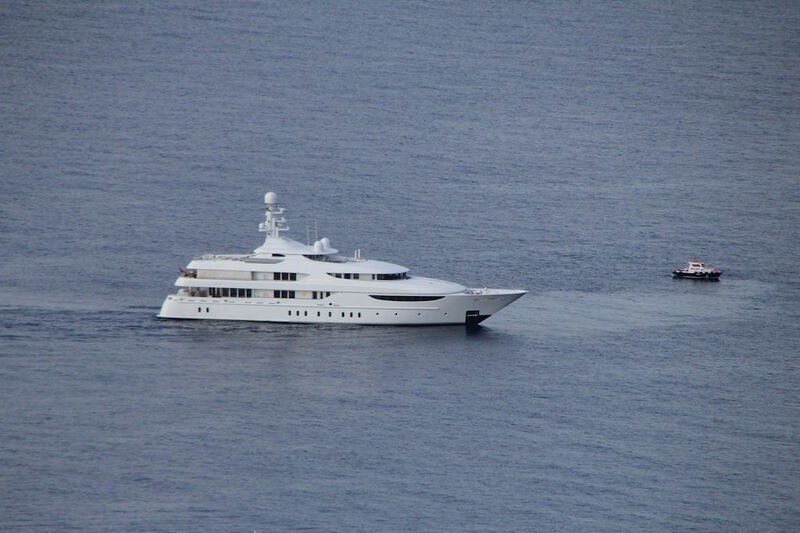 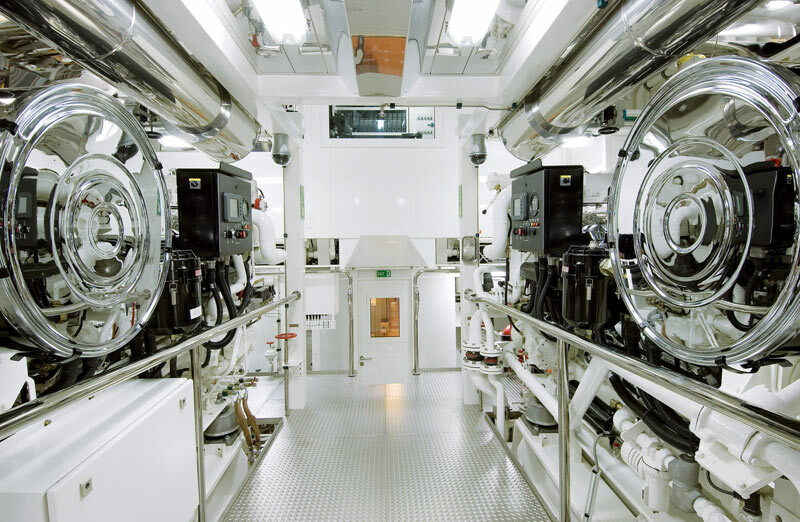 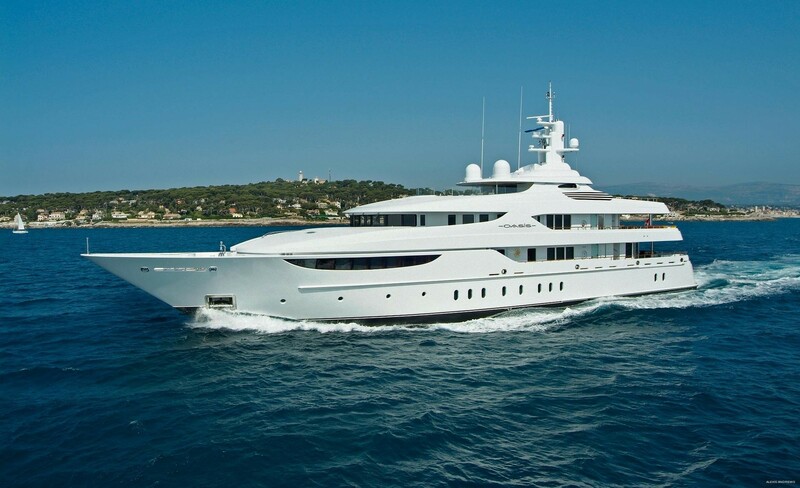 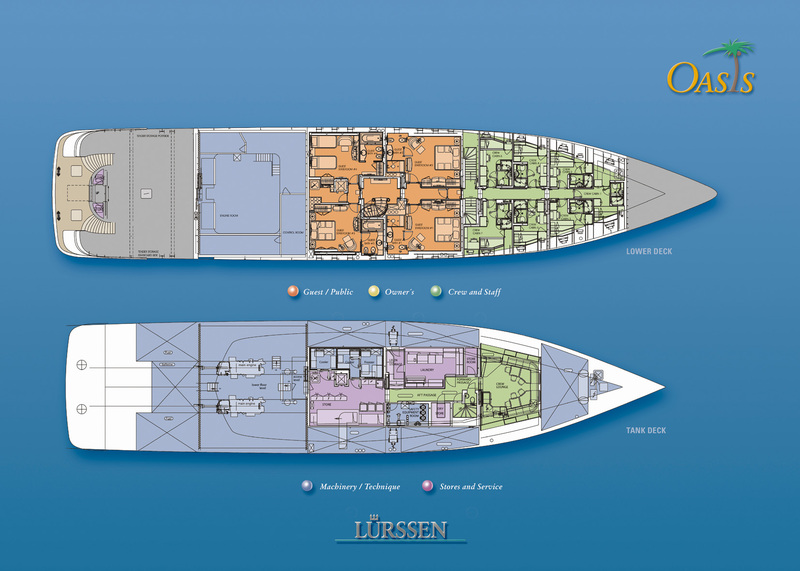 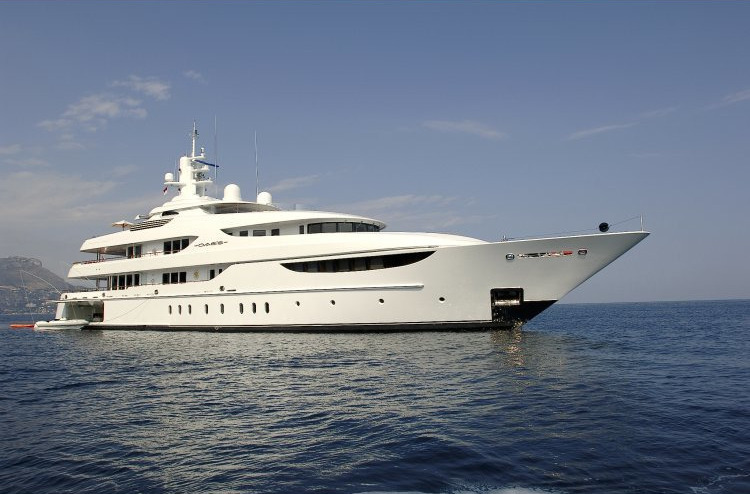 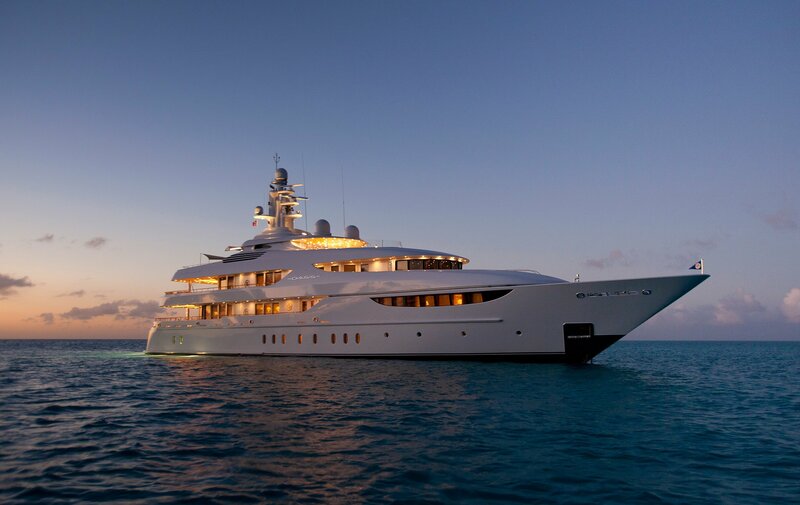 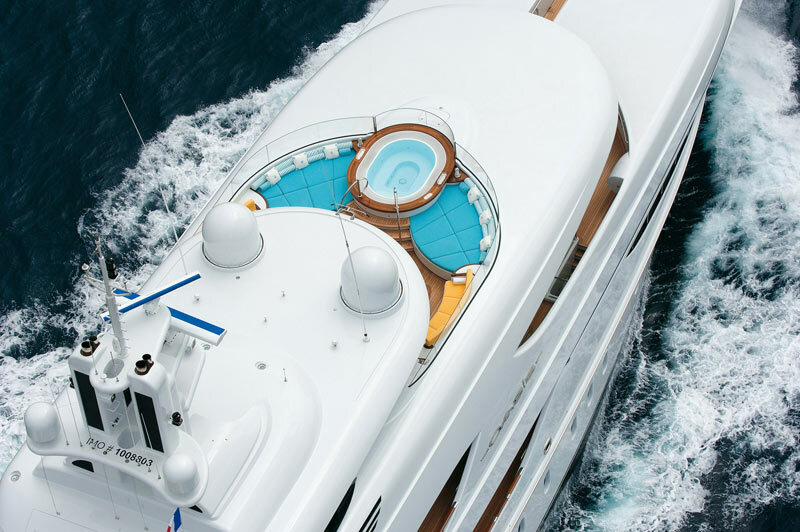 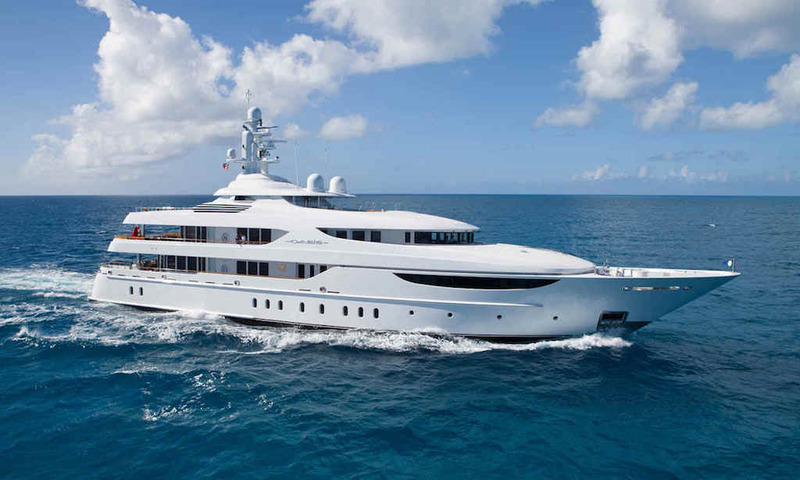 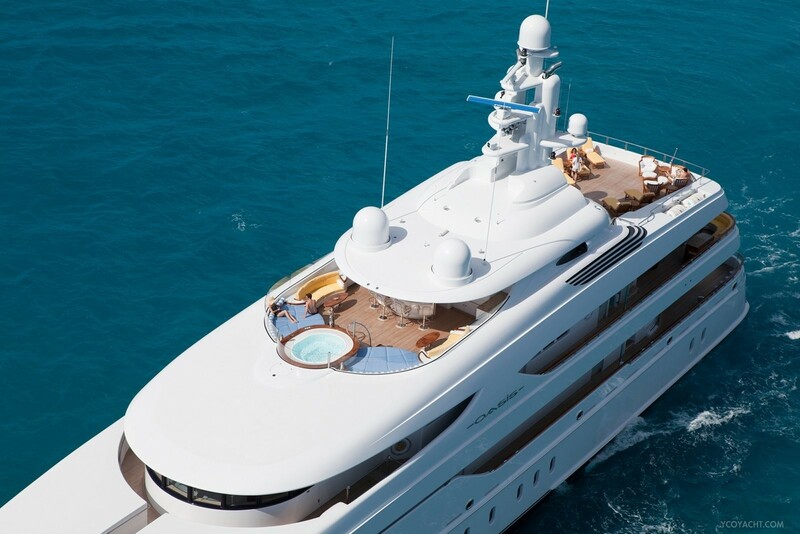 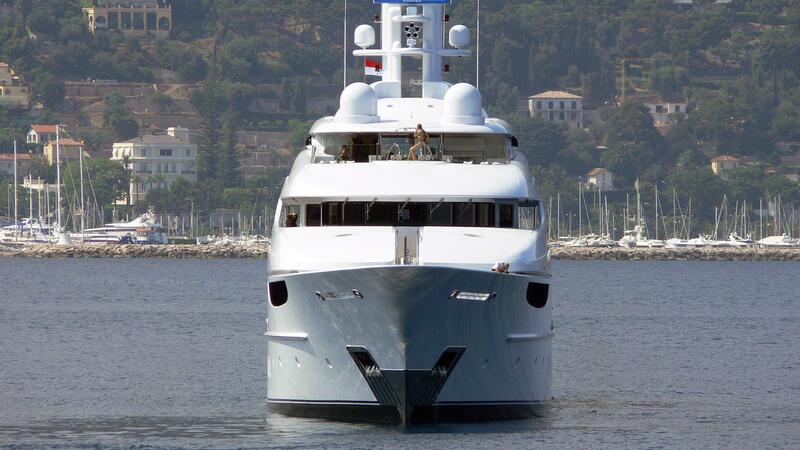 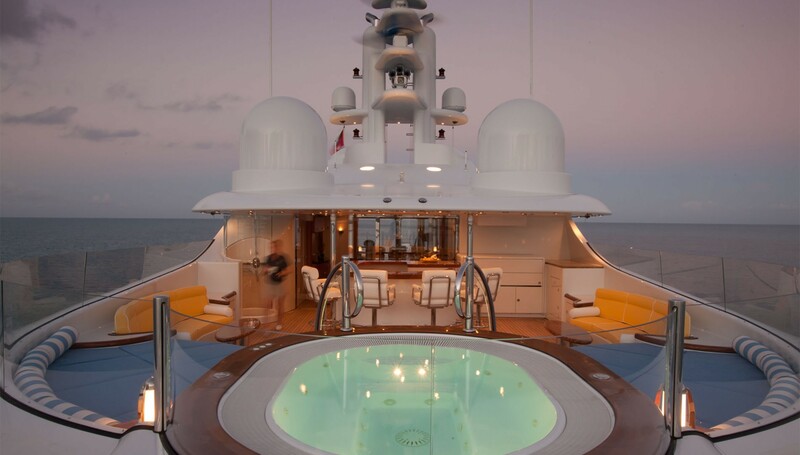 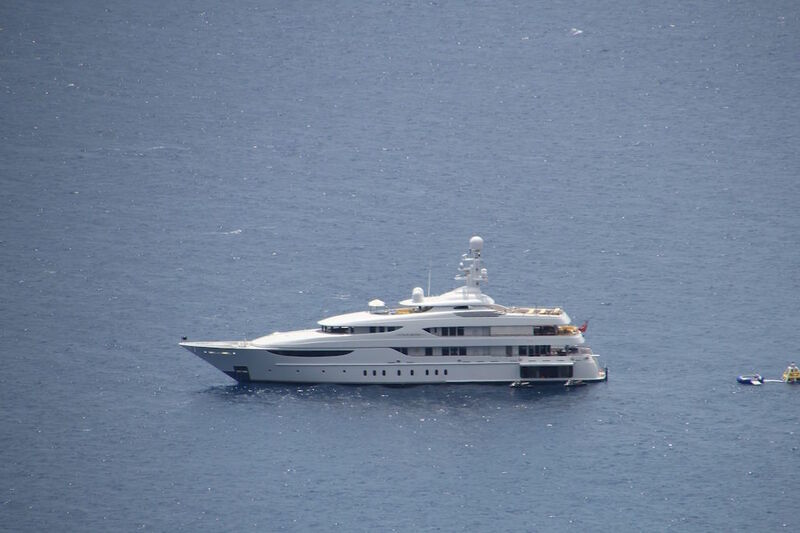 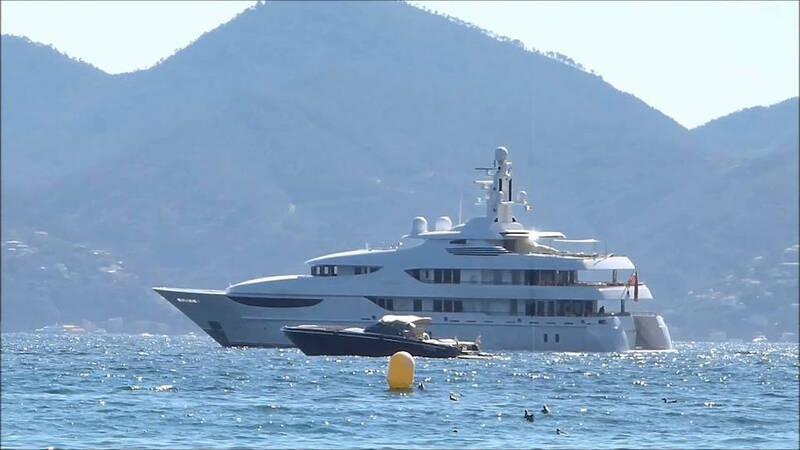 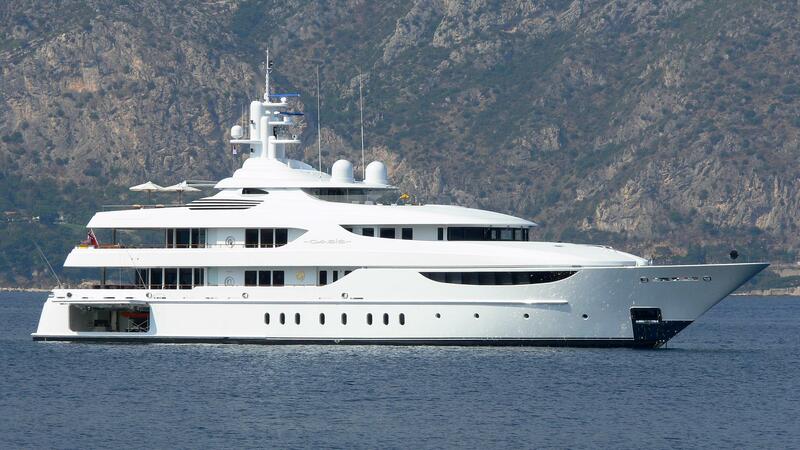 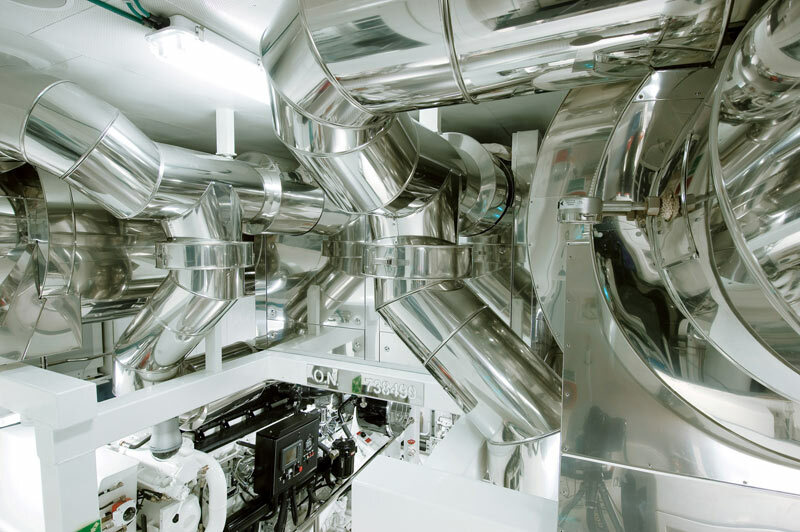 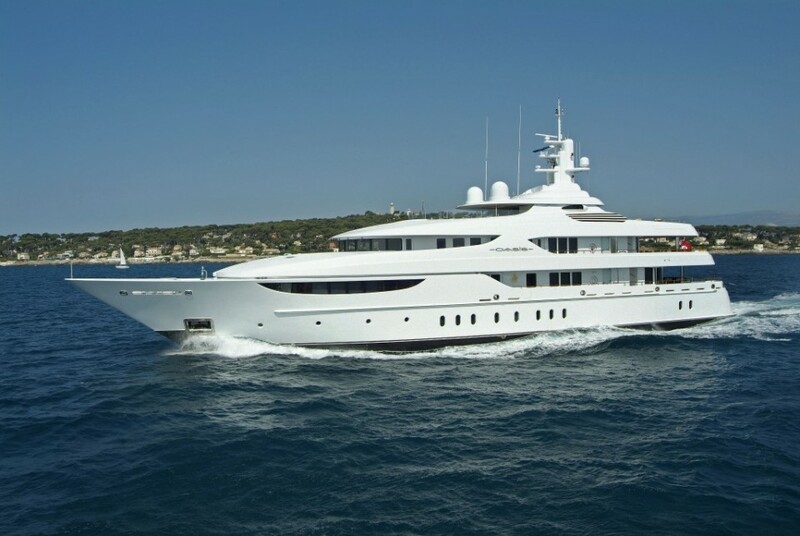 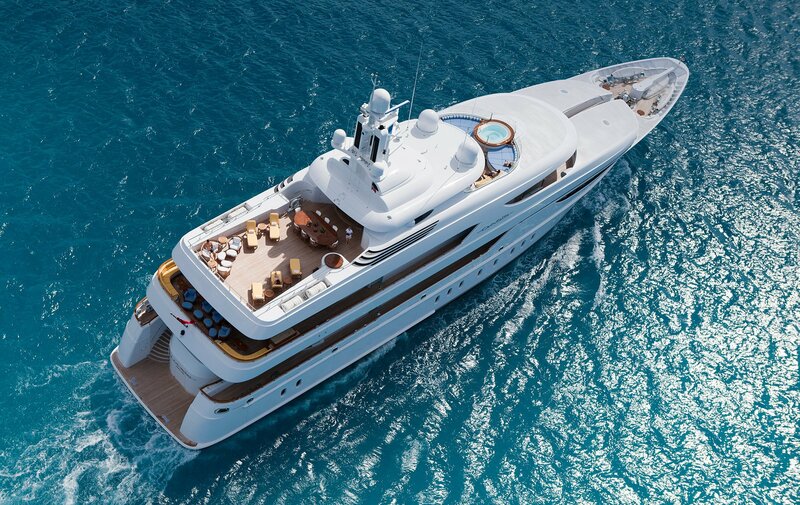 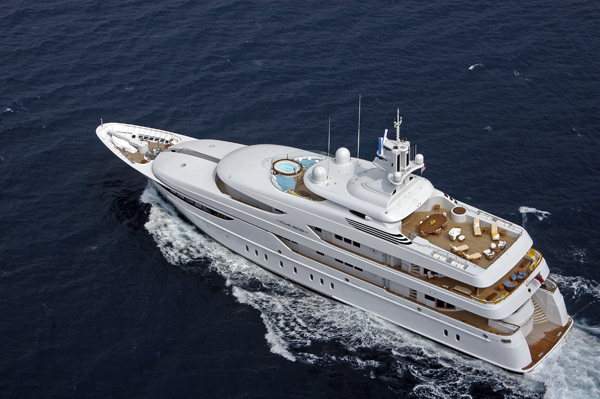 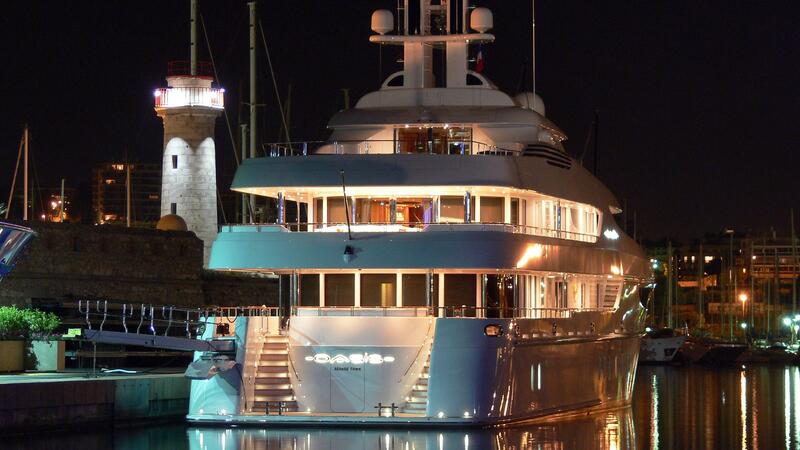 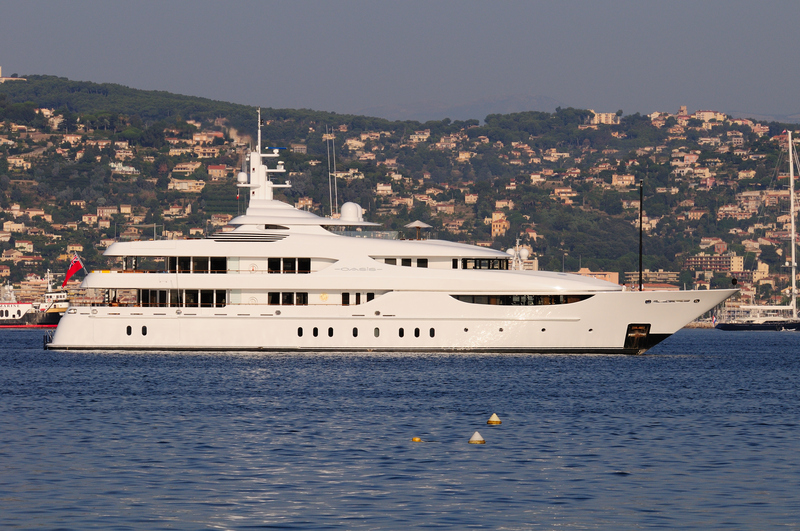 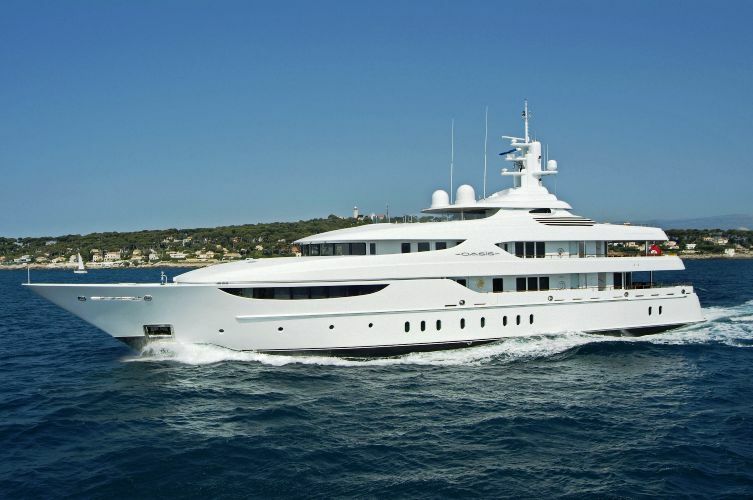 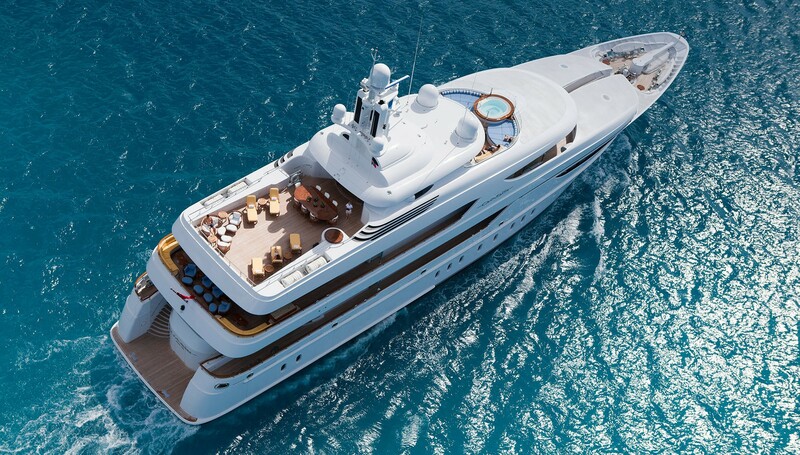 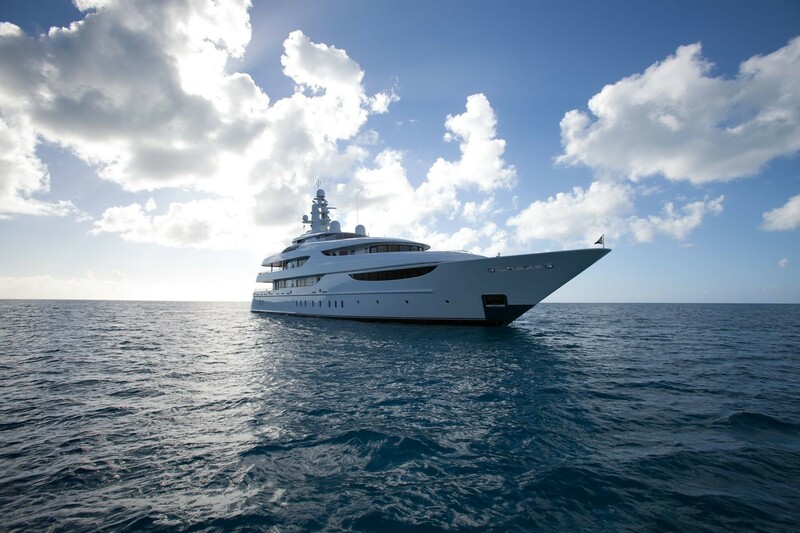 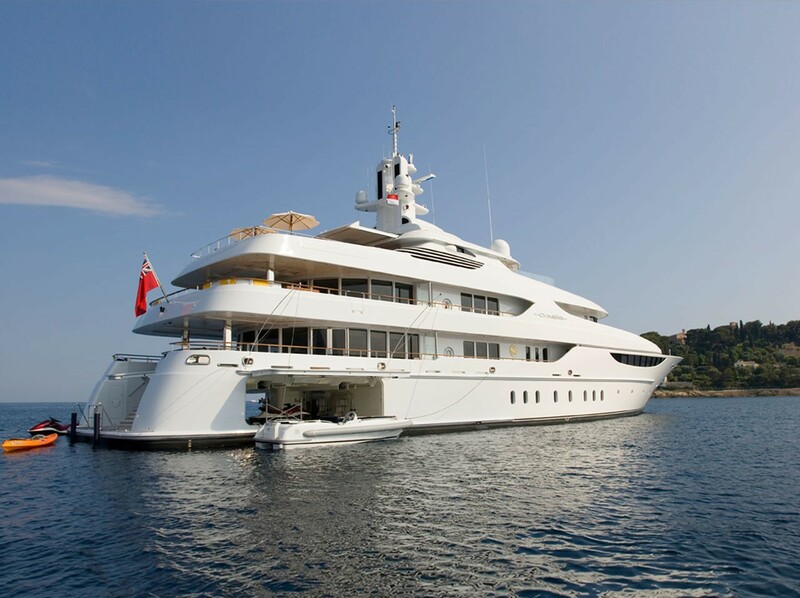 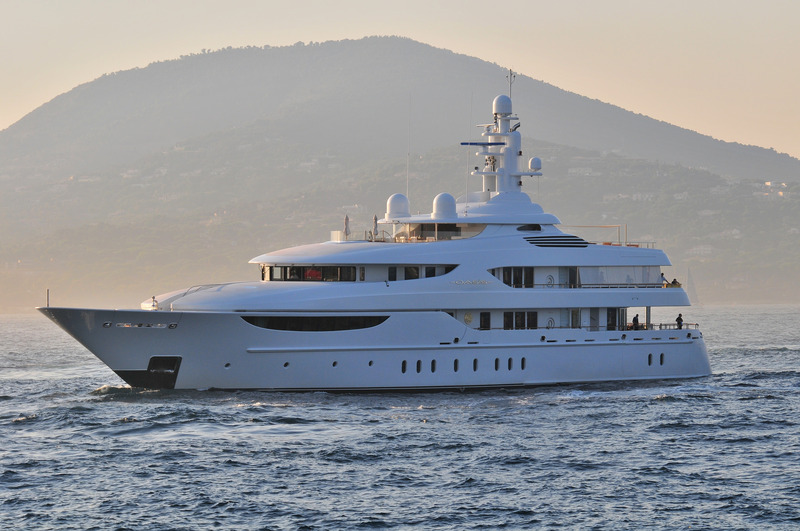 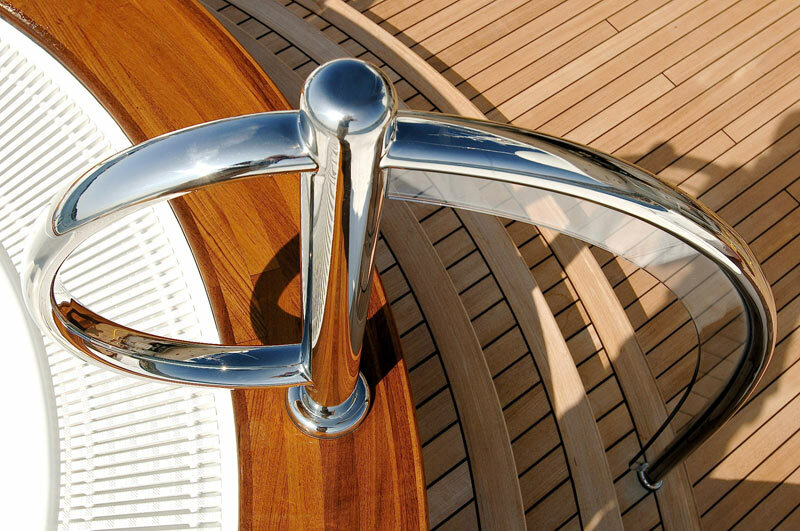 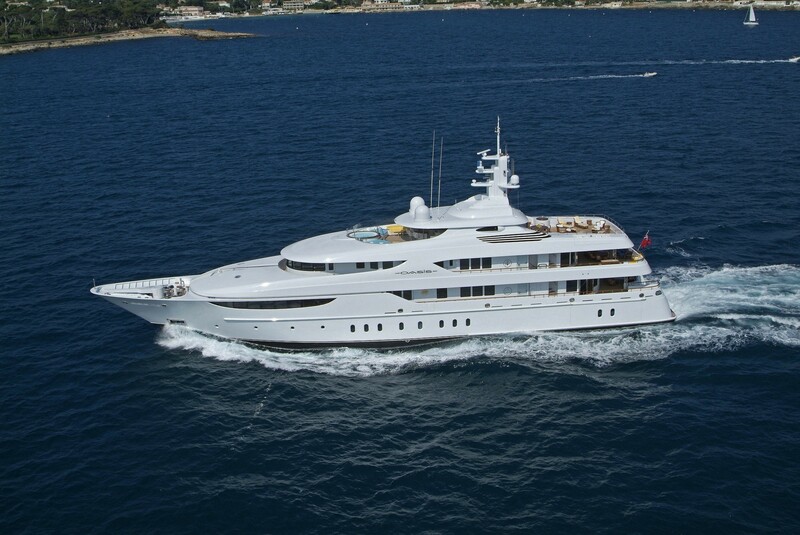 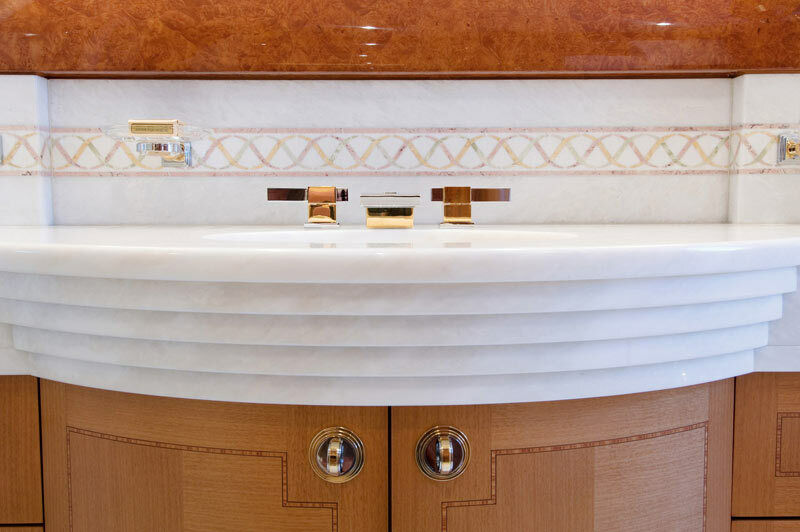 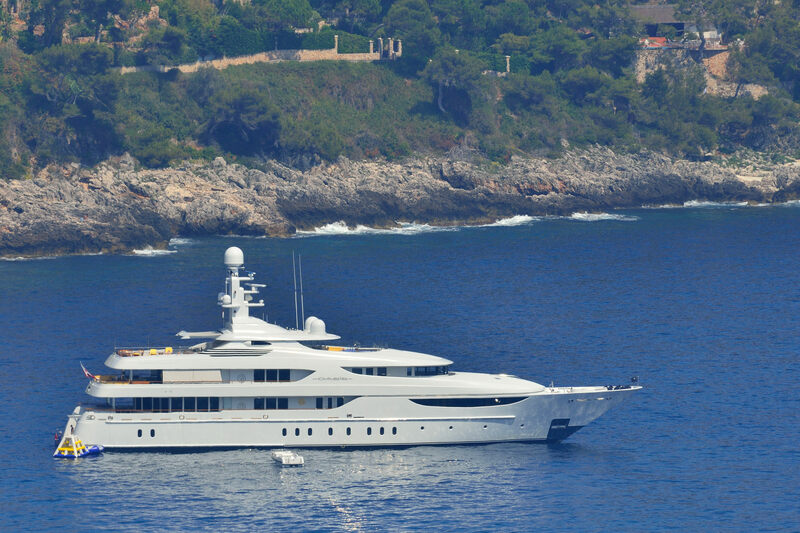 Luxury superyacht Oasis is 2006 launched vessel from the pioneering German shipyard Lurssen. 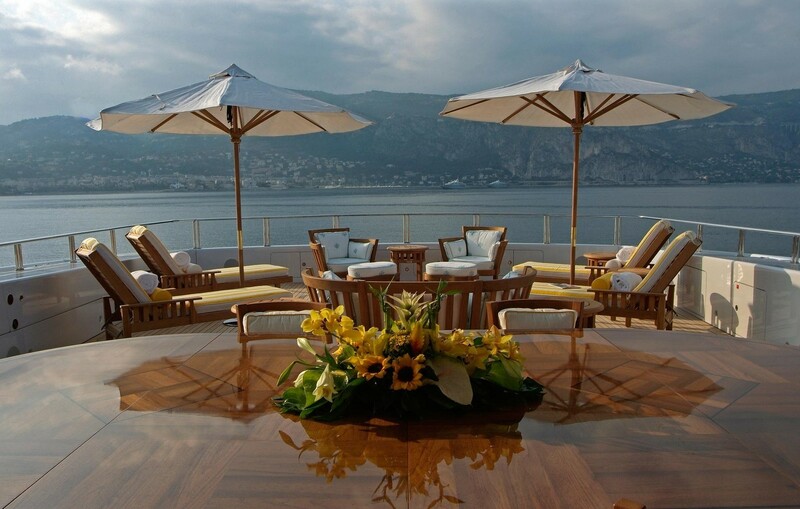 Oasis with her resplendent with innovative design features and luxurious accommodation for 12 guests. 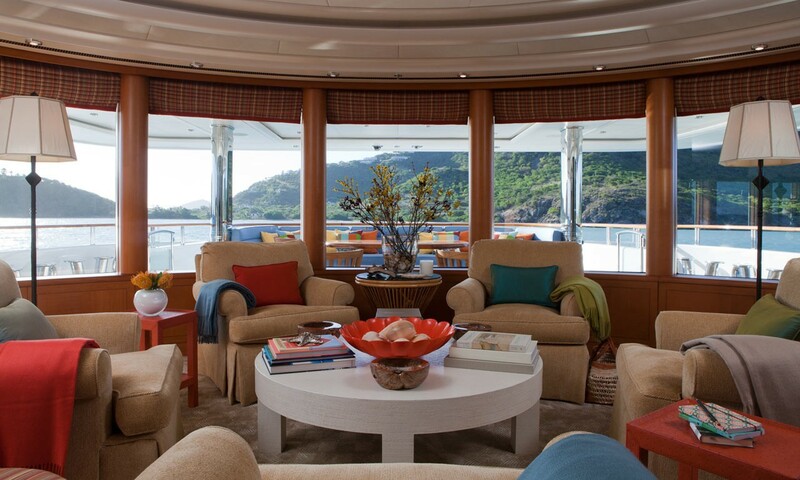 With an interior designed by Glade Johnson, her sweeping views evoke an elegant ambiance. 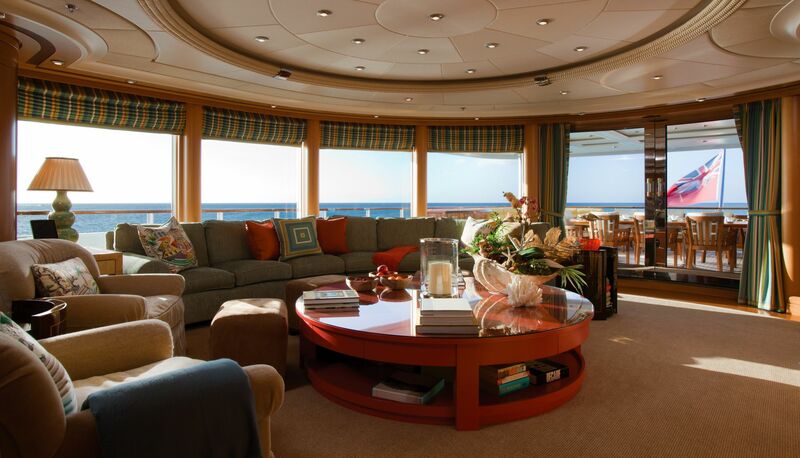 Offering accommodation for twelve in a full width-master suite and five generous guest cabins, there is no shortage of luxurious and spacious living space. 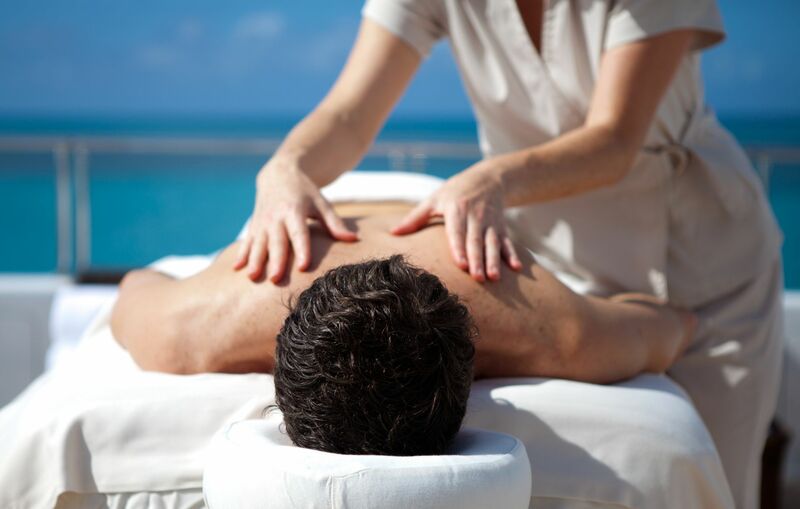 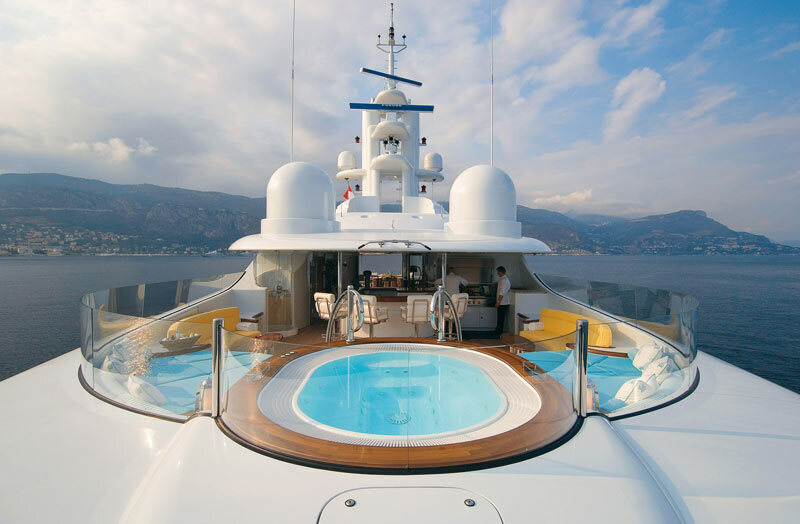 Some of Oasis’s notable features include the open-air sundeck with built-in bar, Spa Pool and barbecue area and a professionally equipped gymnasium that transforms into a private nightclub. 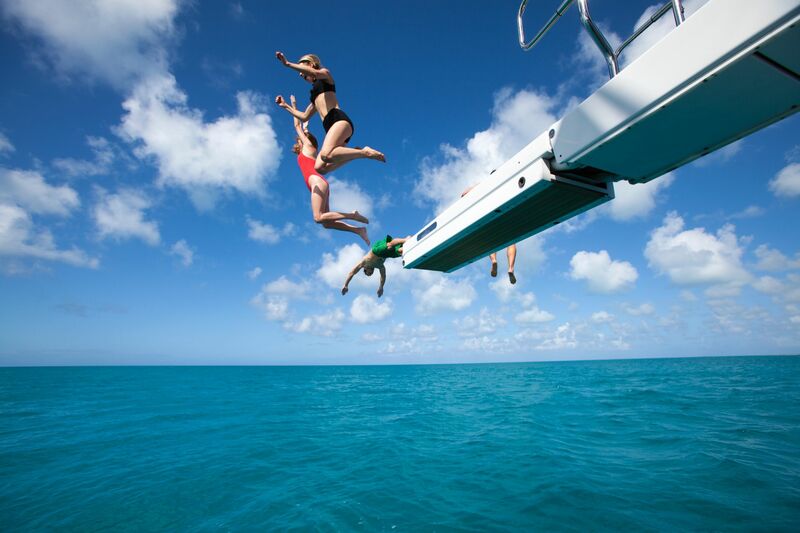 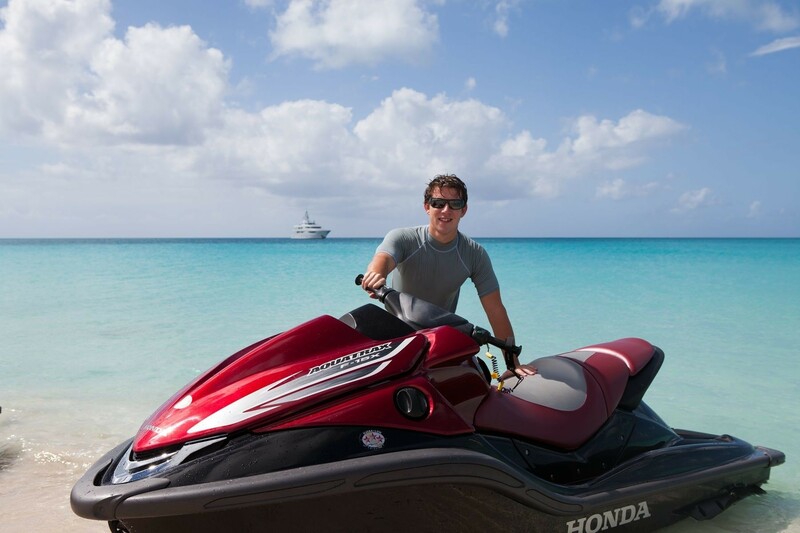 There is a great variety of water toys offered to charter guests for some extra fun while cruising aboard Oasis. 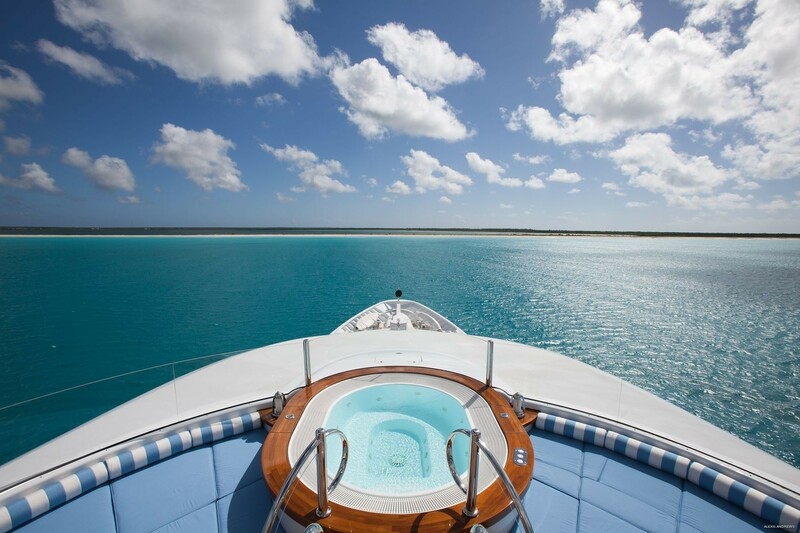 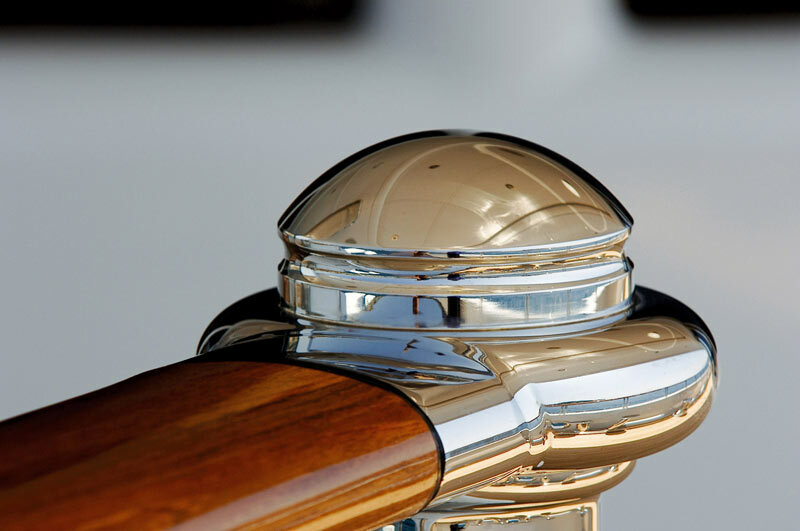 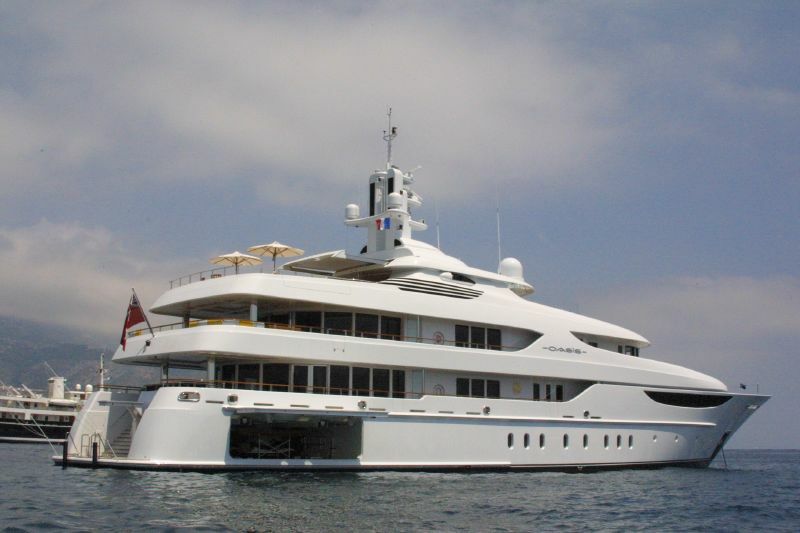 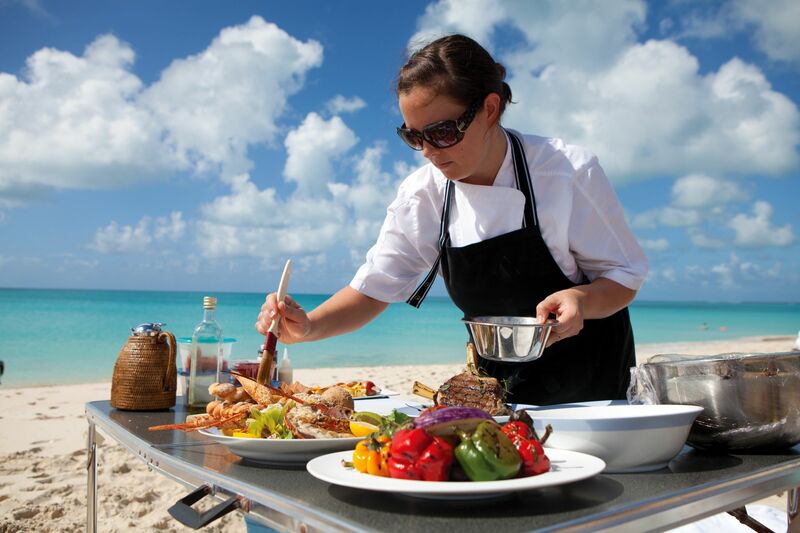 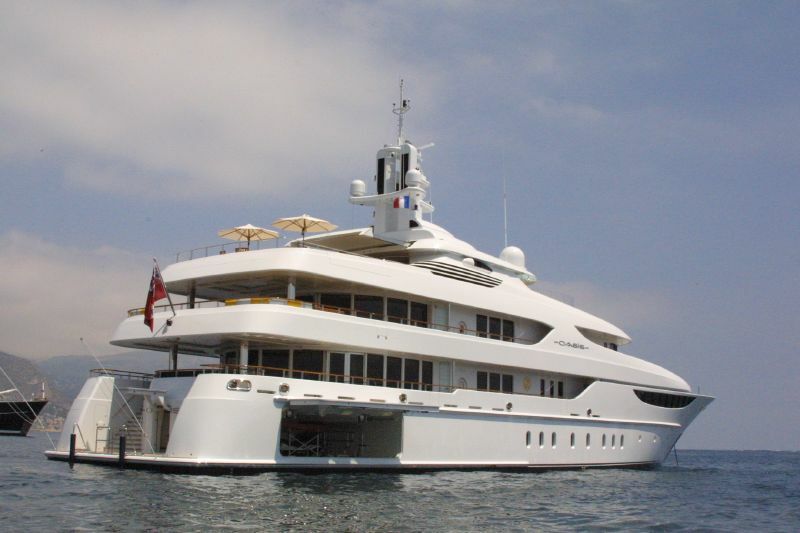 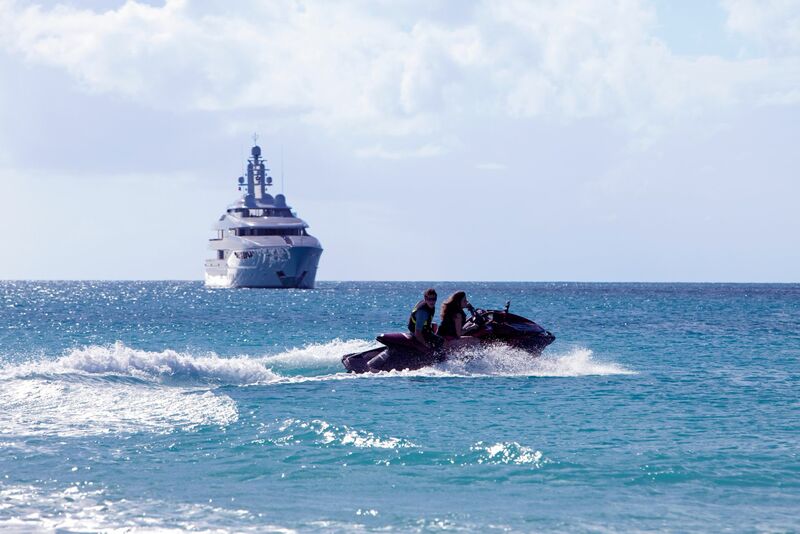 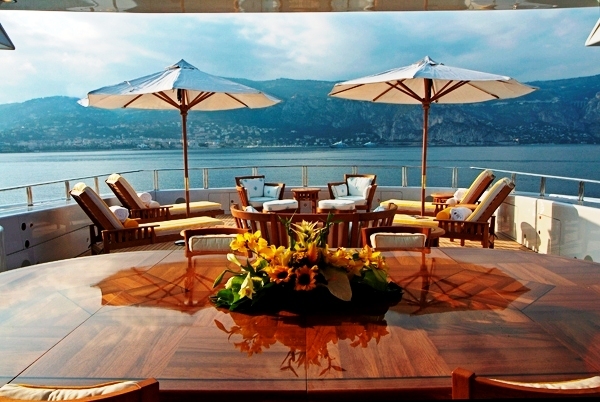 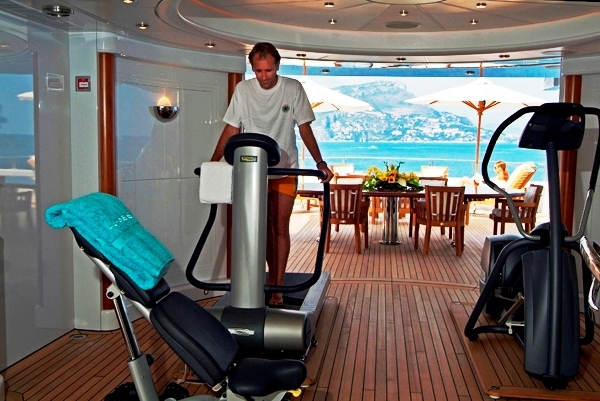 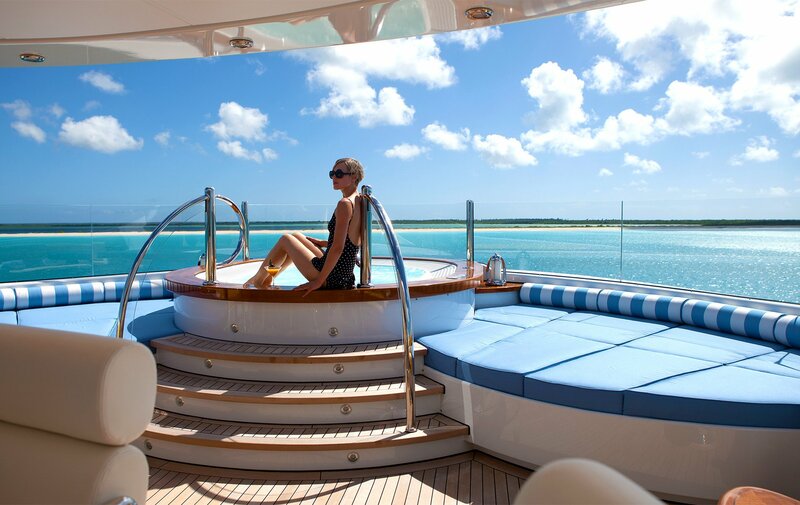 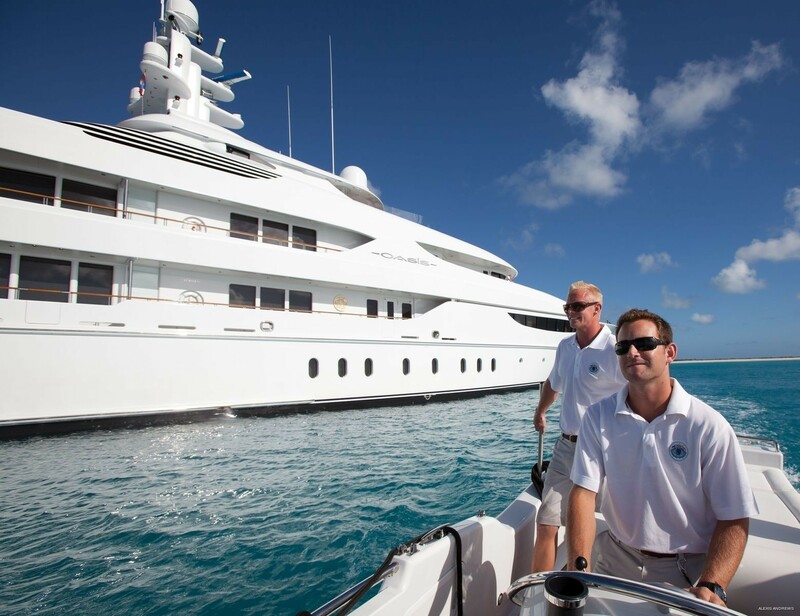 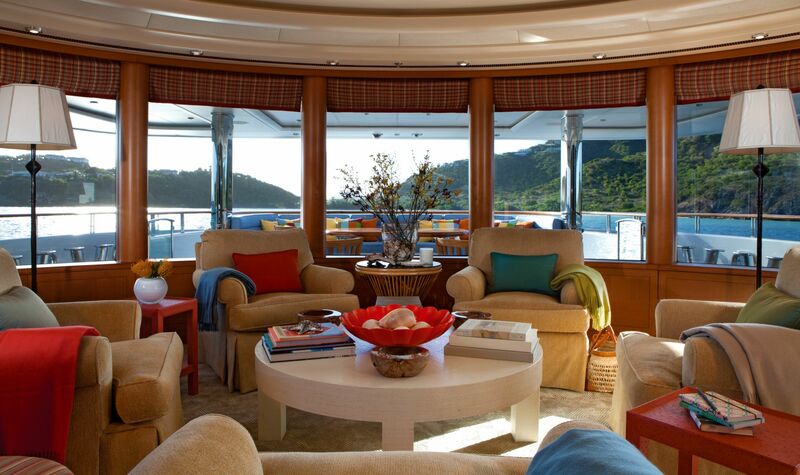 Luxury yacht Oasis provides yacht charter accommodation for up to twelve guests. 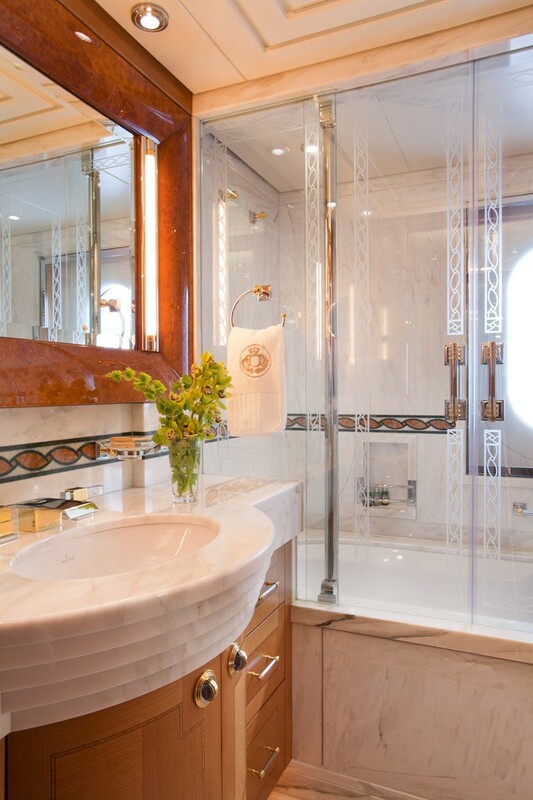 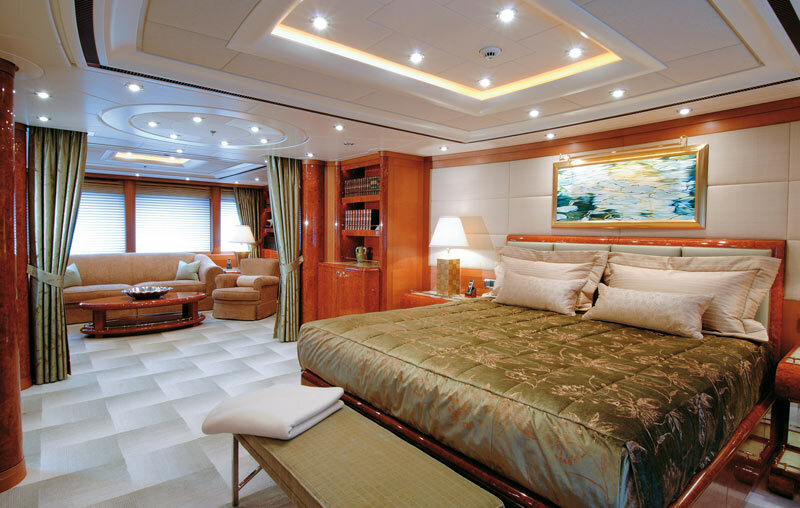 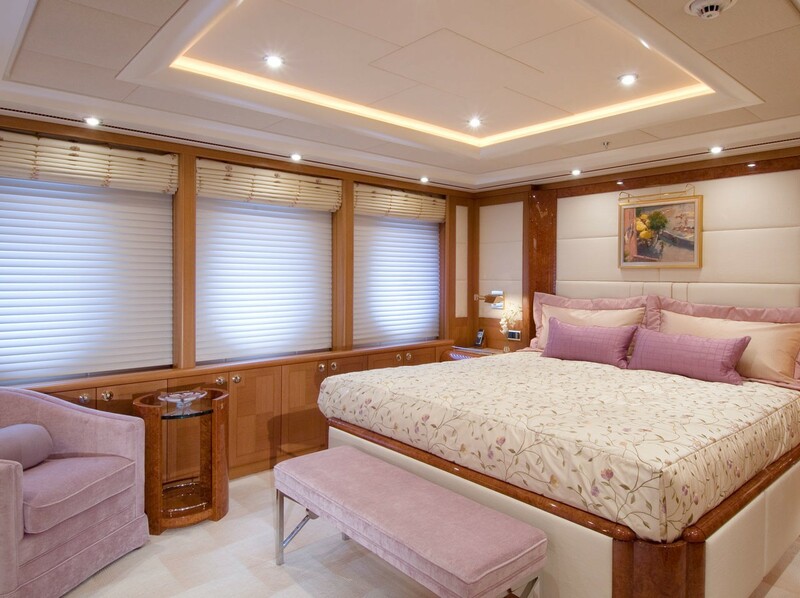 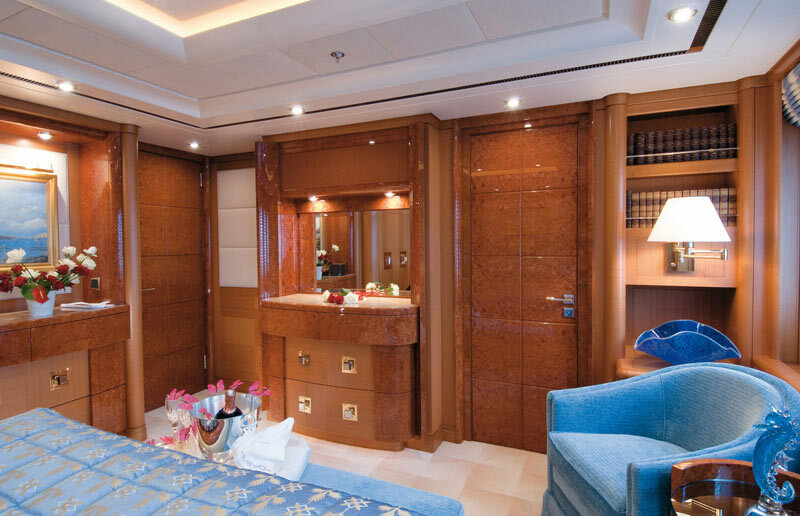 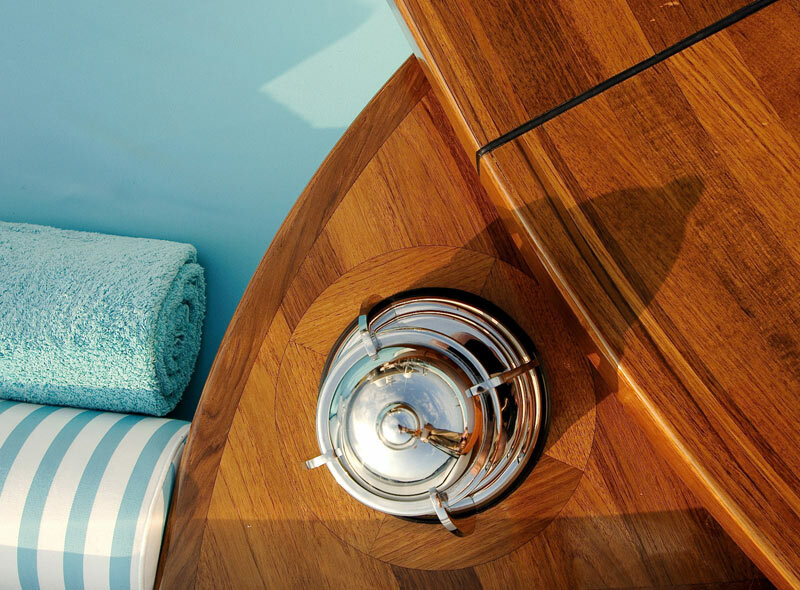 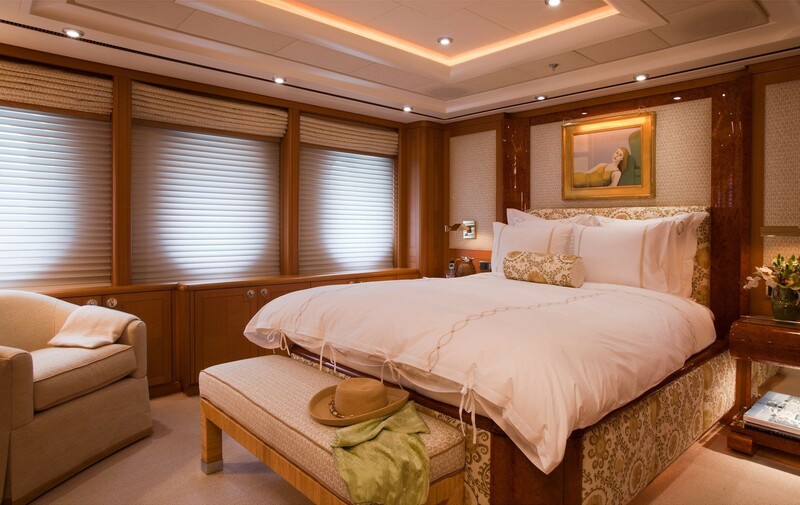 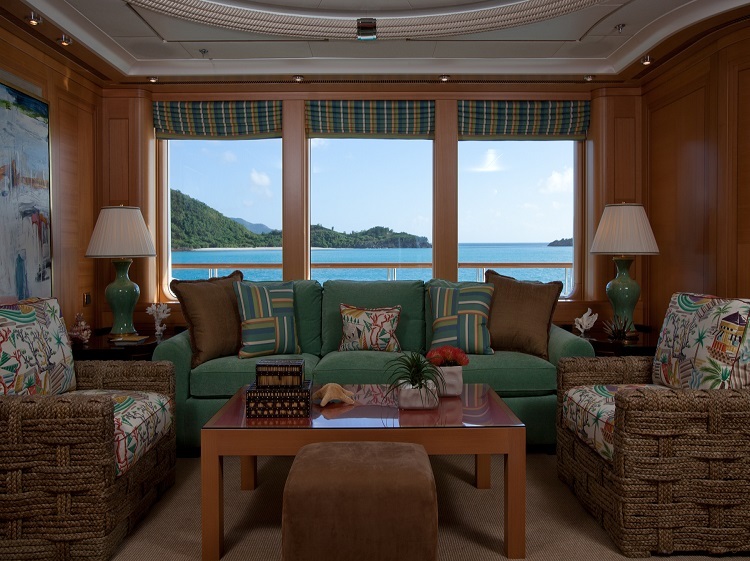 Master Stateroom is located on the main deck and features a king bed, ensuite marble bathroom with his and hers facilities, Spa Pool tub, walk-in shower, walk-in closets, annexed lounge, private office. 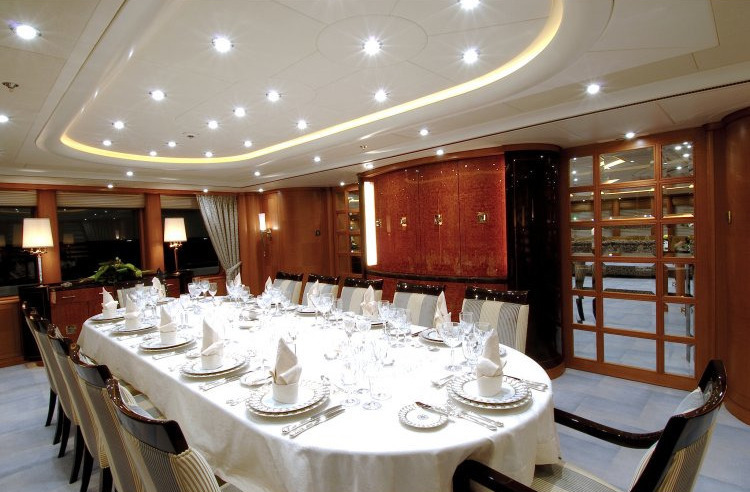 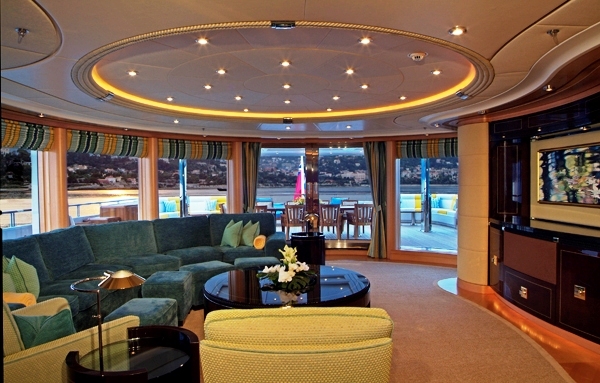 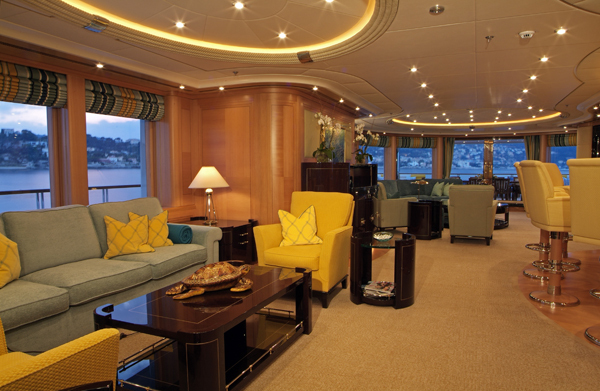 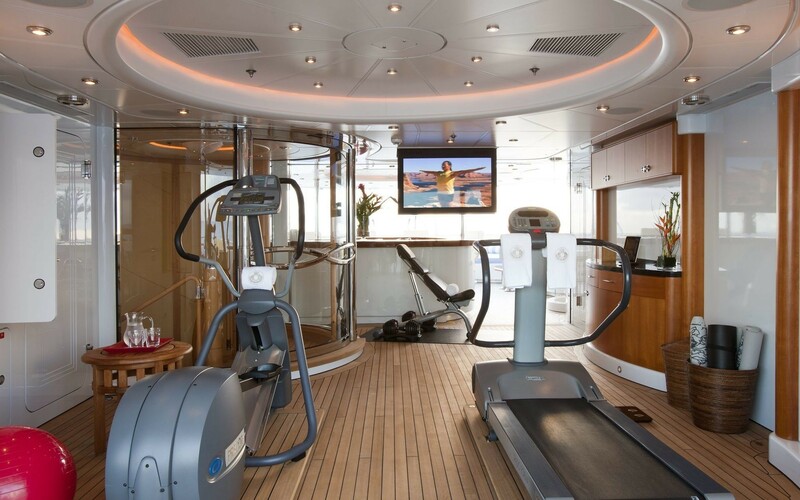 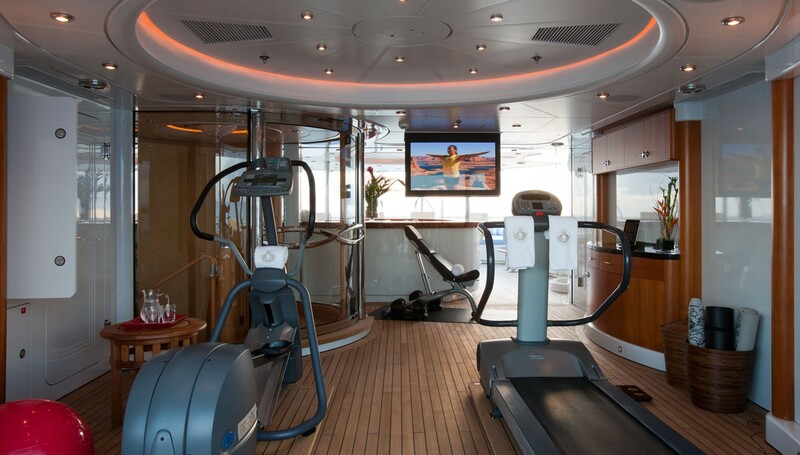 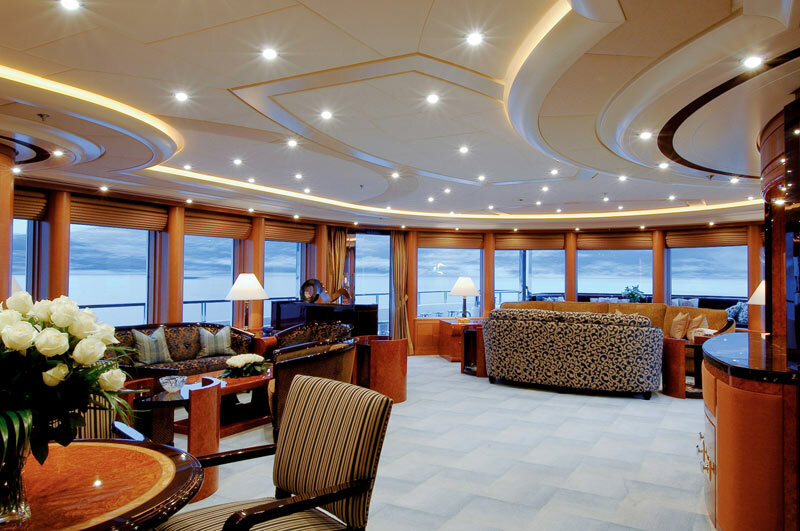 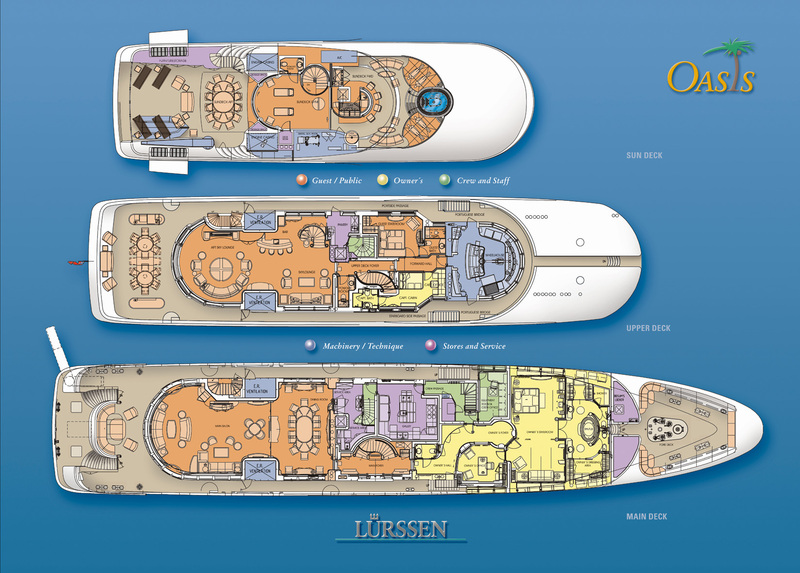 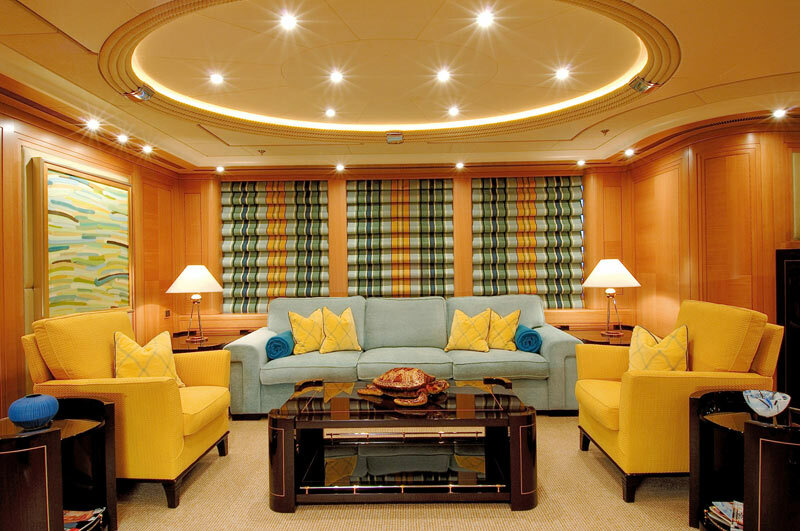 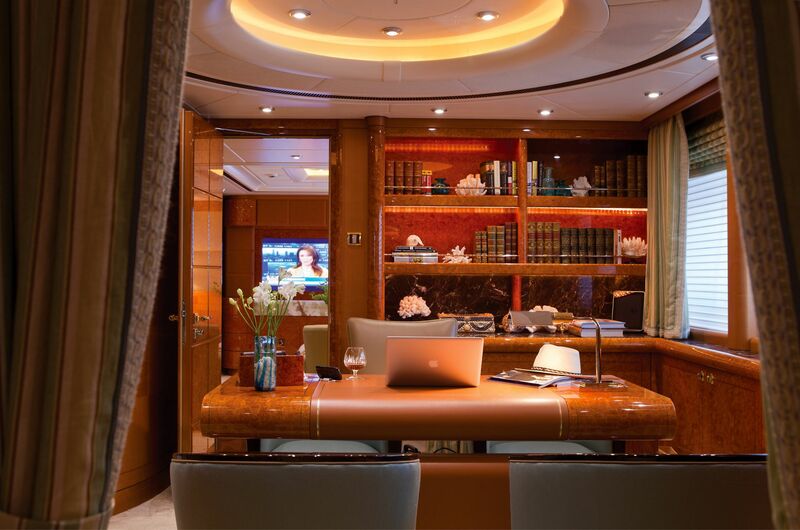 5.1 sound in stateroom and lounge with 50” Plasma screens, 42” Plasma in office, AMX control for all room functions incl. 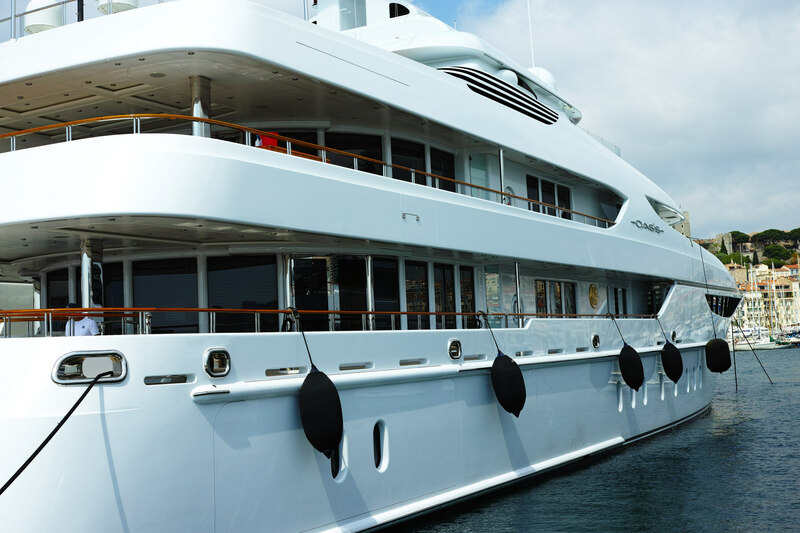 Movies and music on demand, DSTV, and guest features. 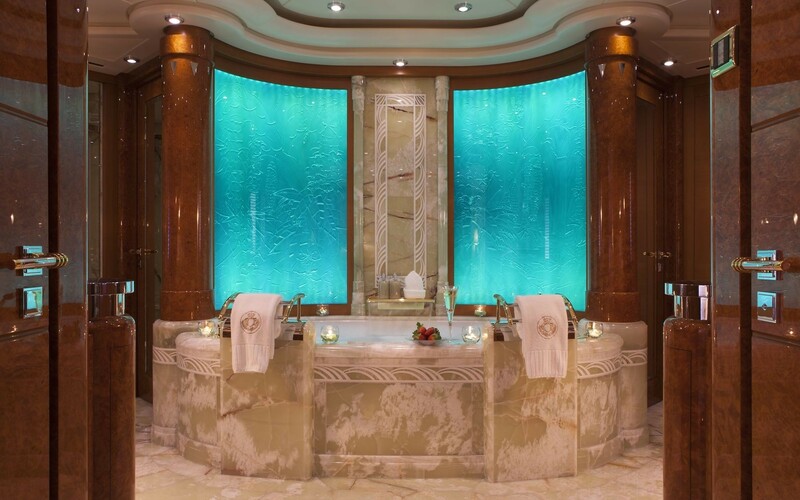 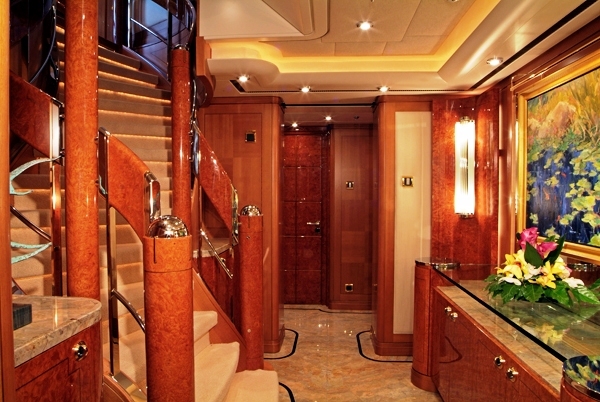 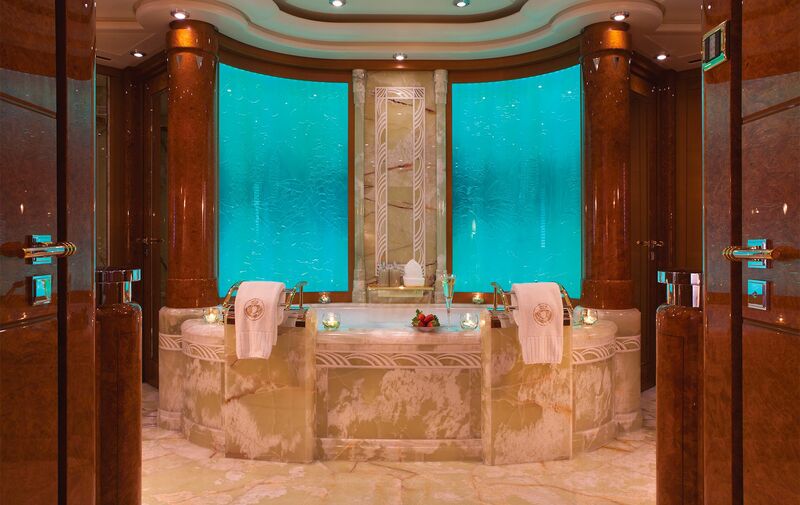 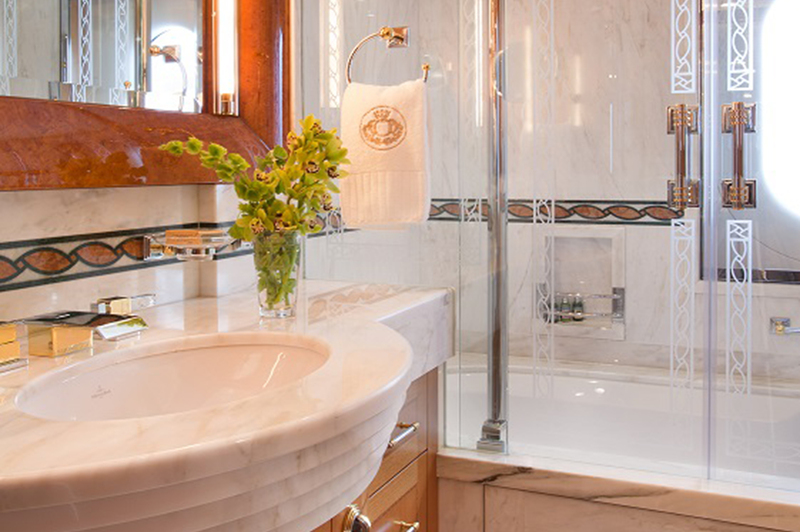 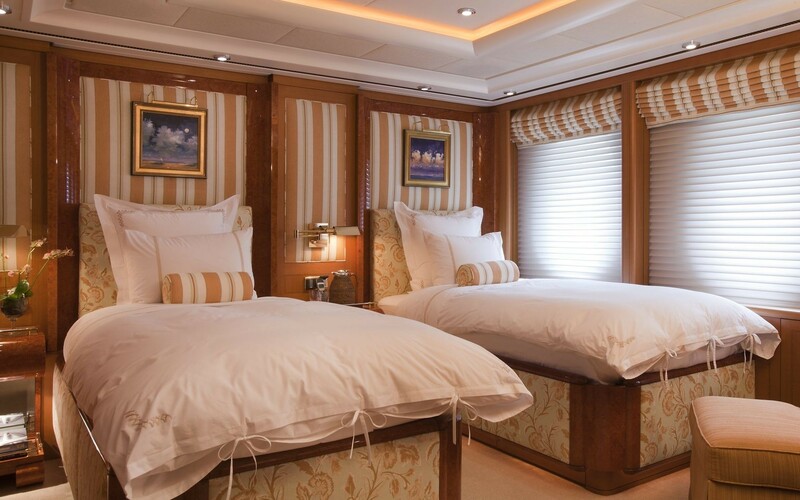 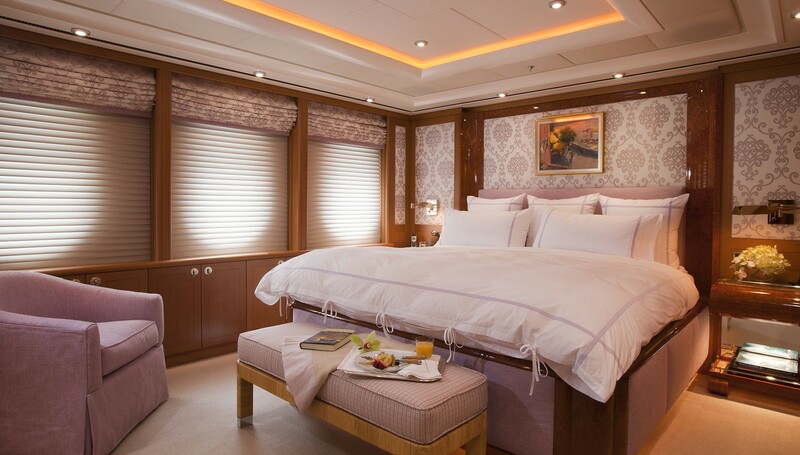 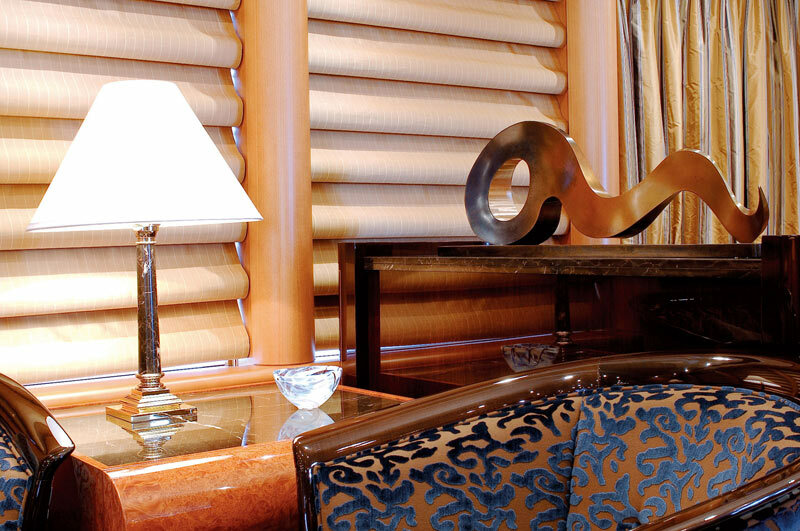 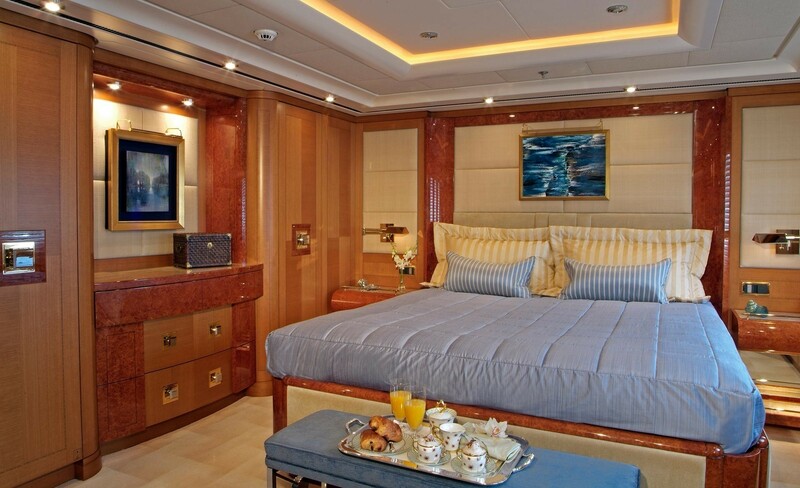 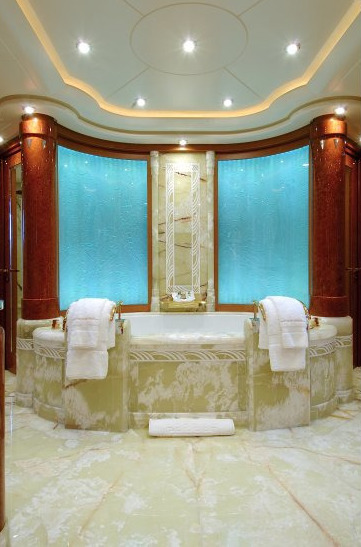 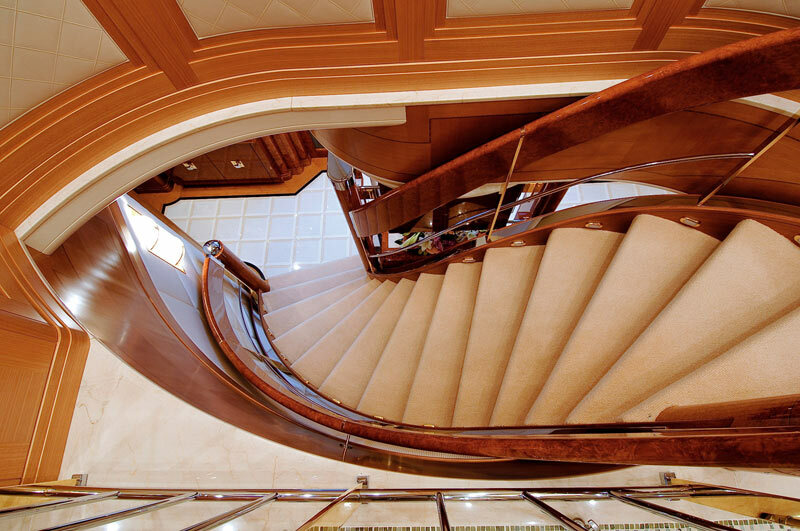 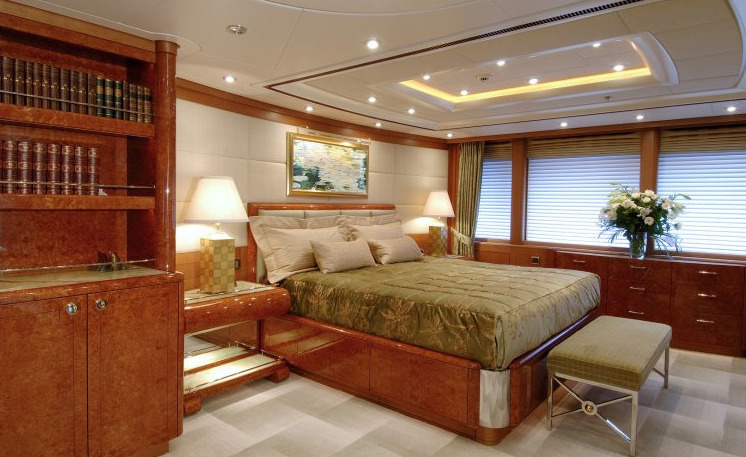 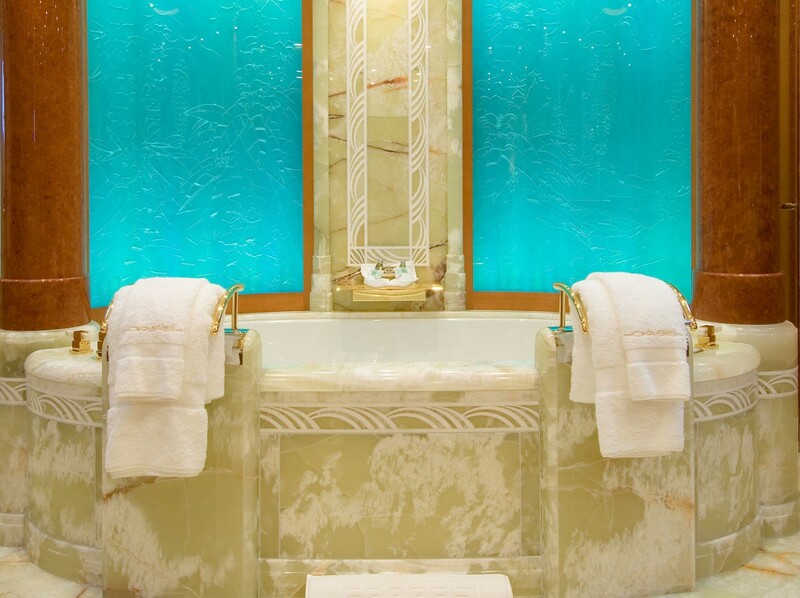 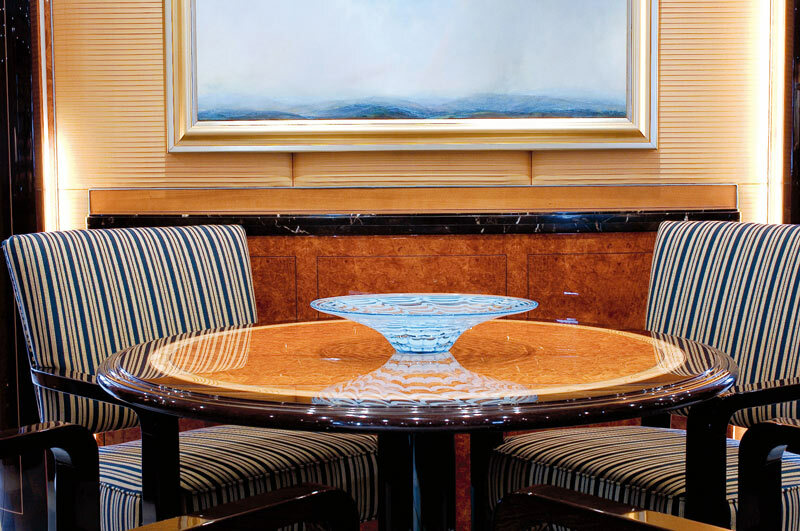 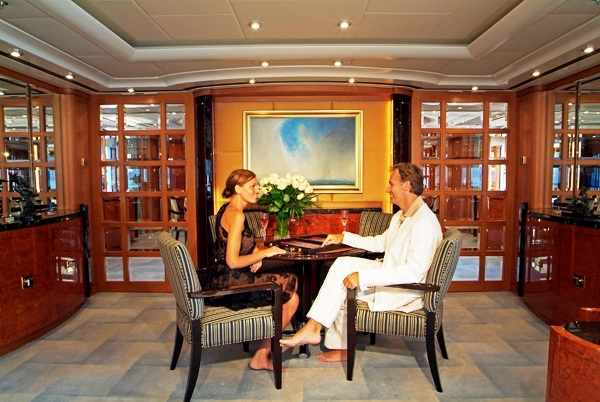 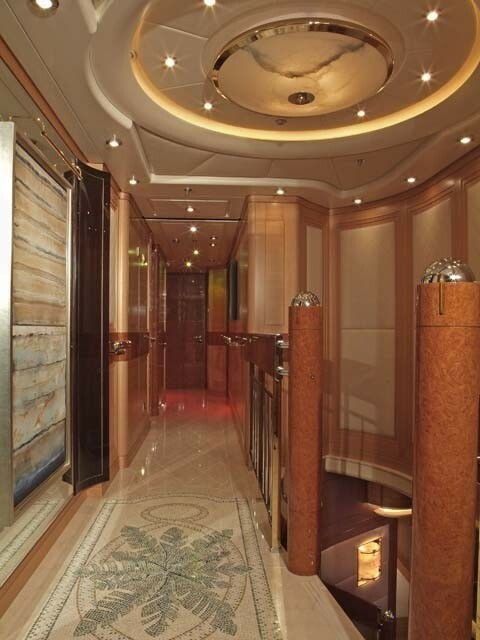 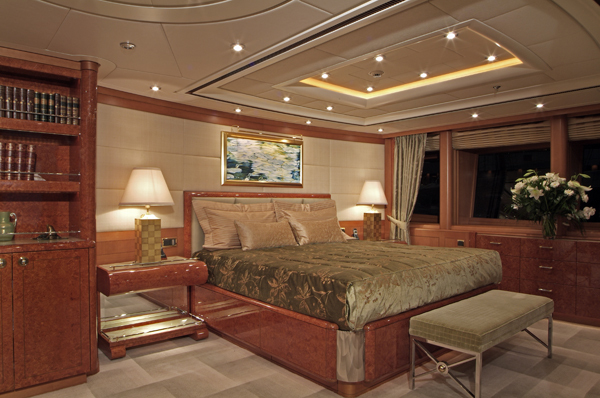 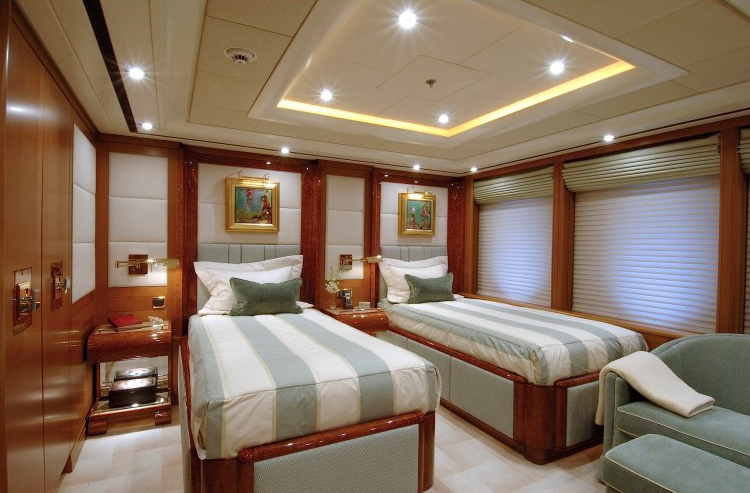 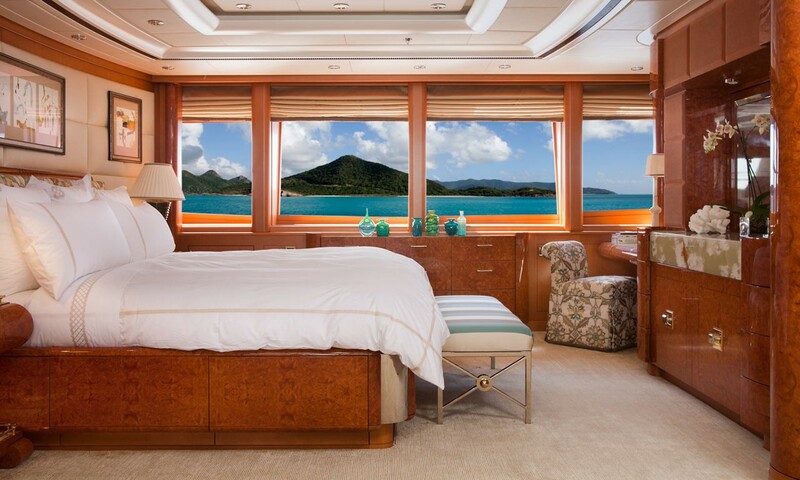 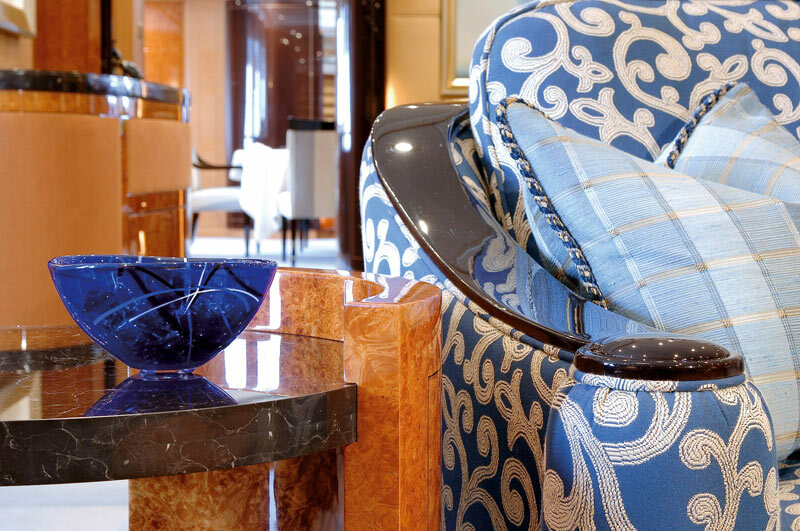 VIP Stateroom hosts a queen bed, ensuite marble bathroom with walk-in shower, walk-in closet. 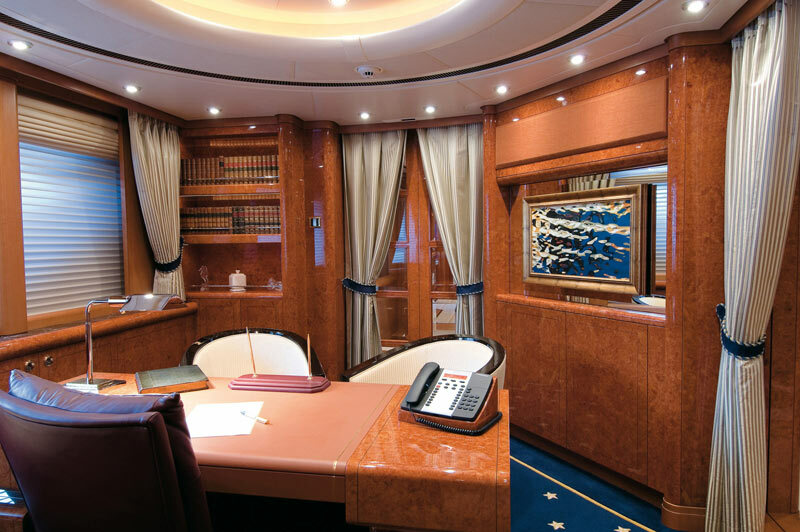 5.0 sound with 42” Plasma, AMX control for all room functions incl. 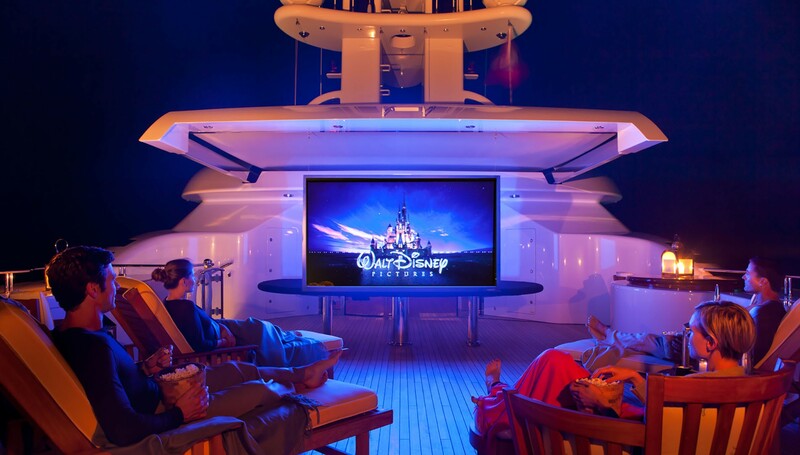 Movies and music on demand, and DSTV. 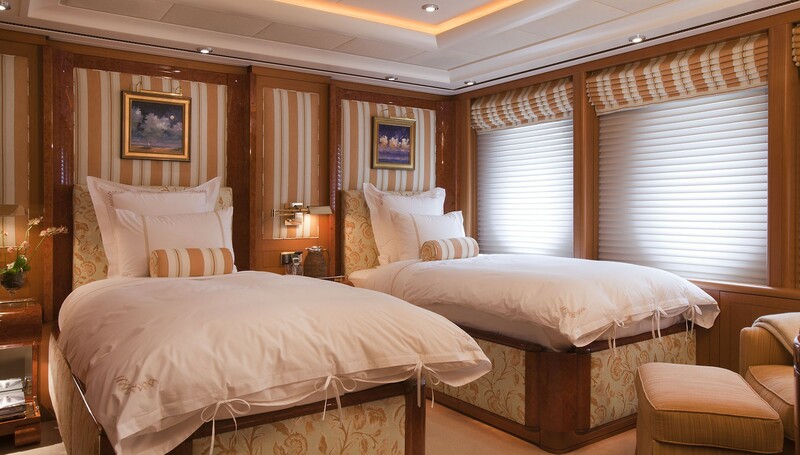 There are also two double guest cabins, one queen and one twin cabin. 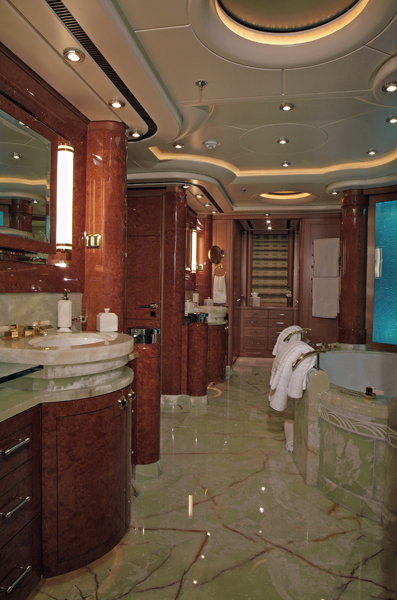 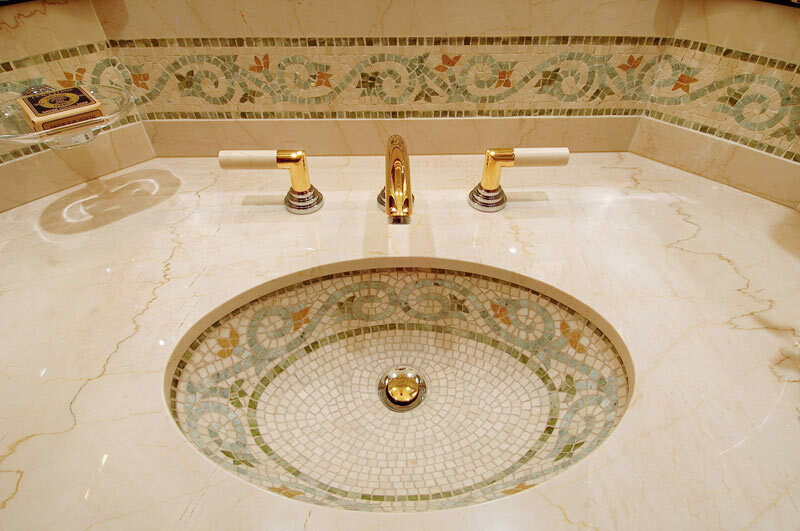 Each a large marble ensuite, and A/V enetertainmnet system. 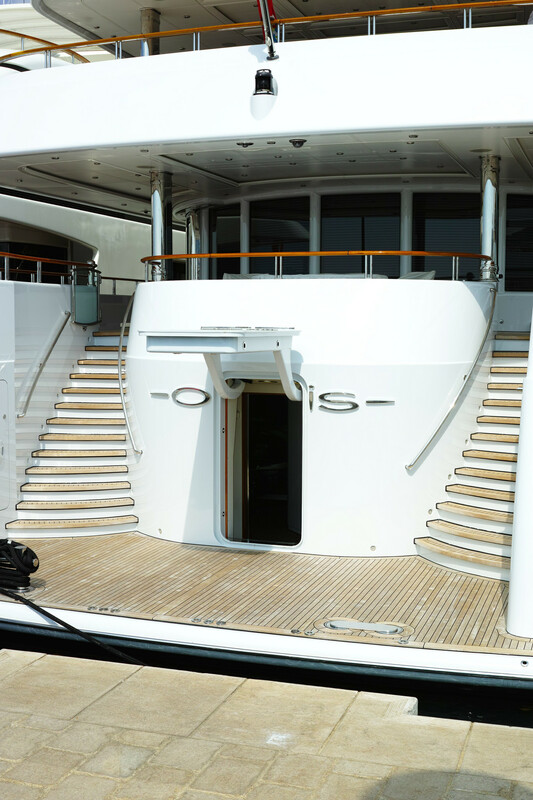 Motor yacht Oasis provides the following yacht charter amenities: Tenders & Toys 1 x 7.5m ‘Vikal’ custom sports tender, Volvo Penta 240 hp 1 x 7.5m ‘Vikal’ custom guest tender, Volvo Penta 240 hp 2 x Honda Aquatrax 2 man watercraft, 180 hp 1 x Laser sailing dinghy 2 x 2 man ocean kayaks Kneeboard, wakeboard, waterskis, towables Diving equipment 2 x Segways 2 x bicycles Audio Visual Equipment and Deck Facilities, Flat screen TV's throughout, Music on Demand, Video on Demand, TV, DVD/Stereo System in all rooms. 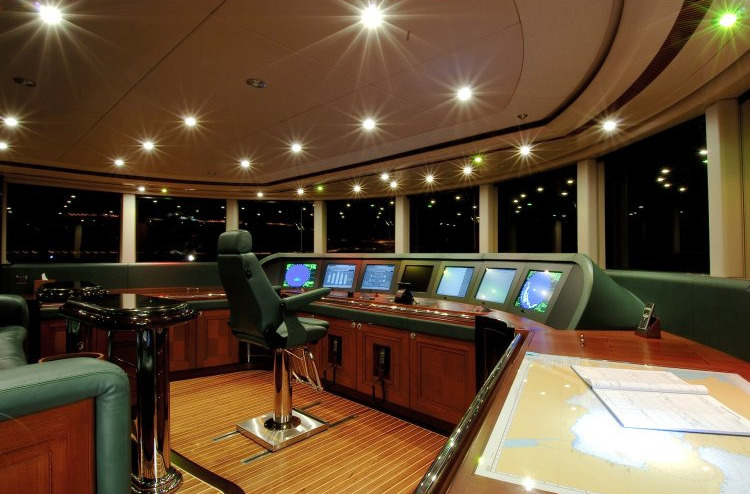 Audio Visual Equipment and Deck Facilities. 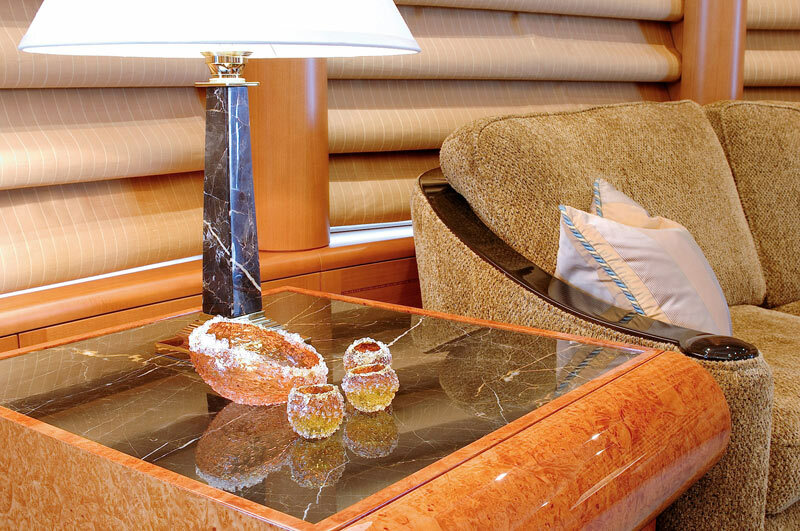 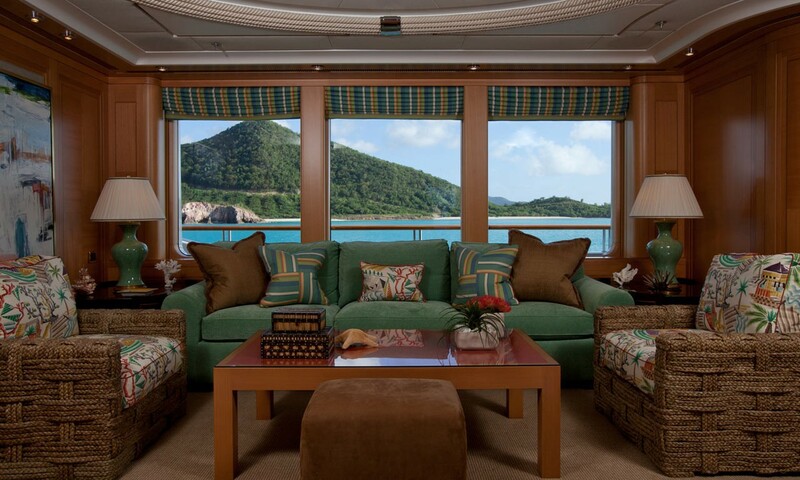 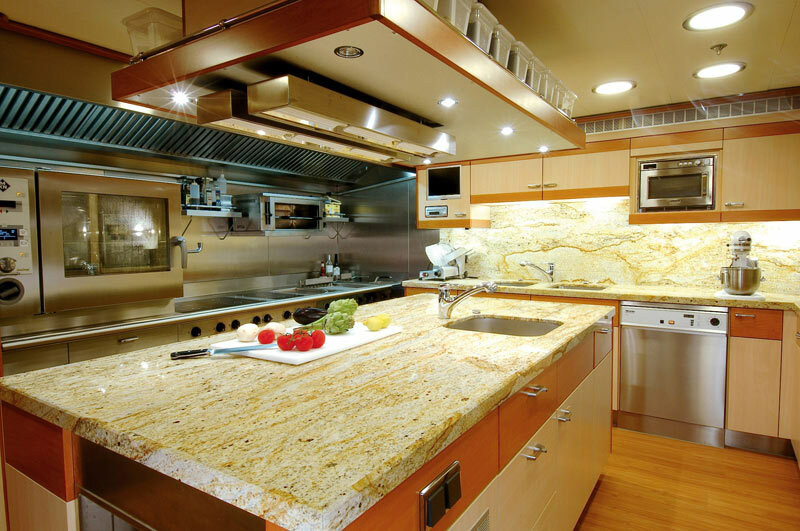 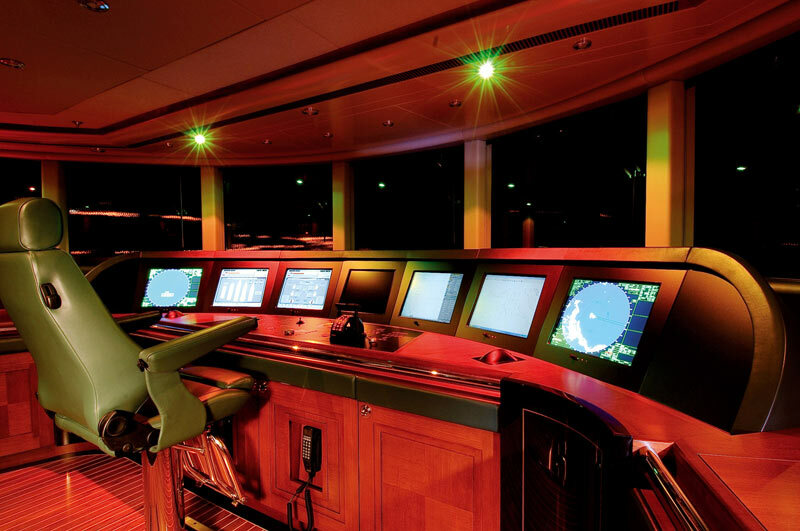 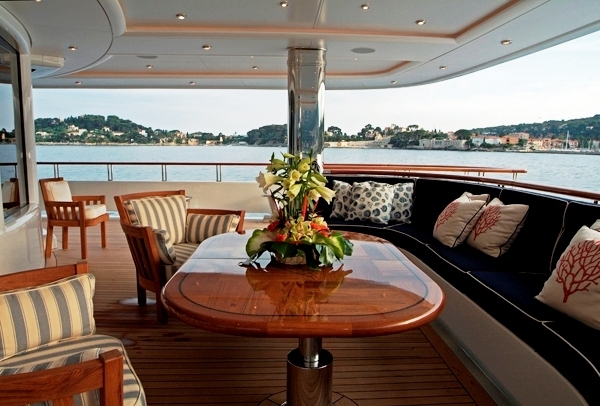 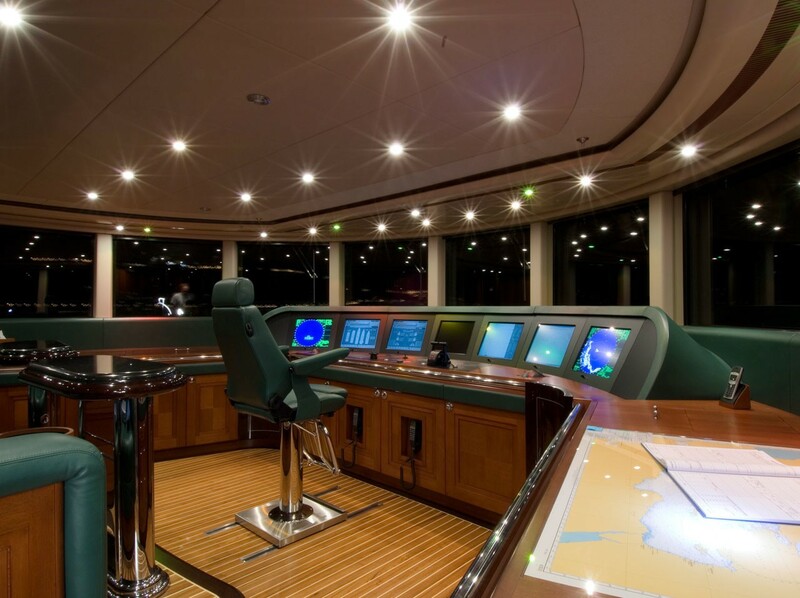 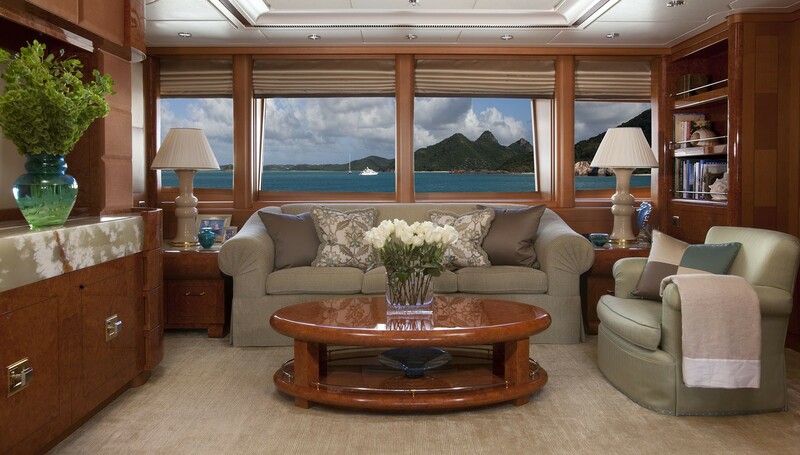 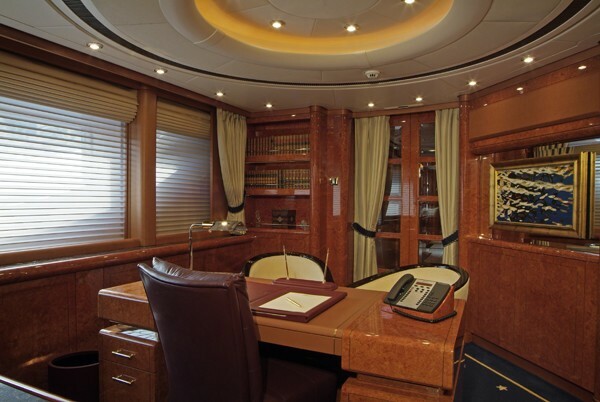 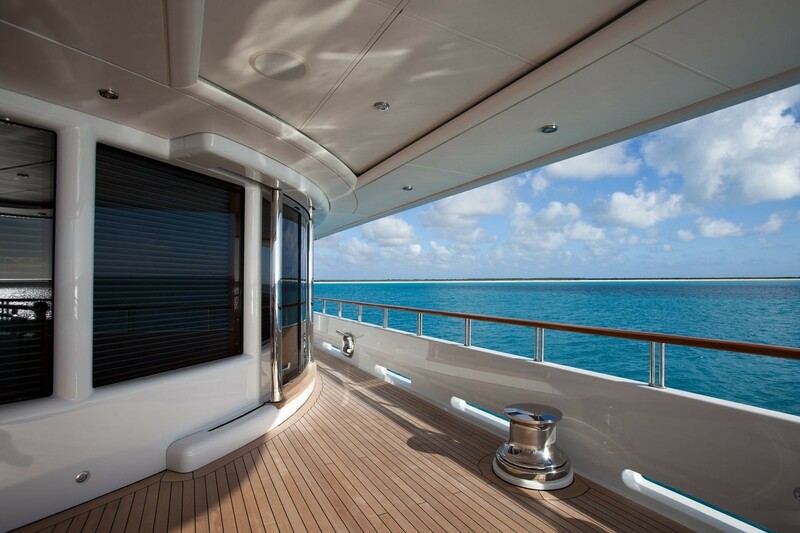 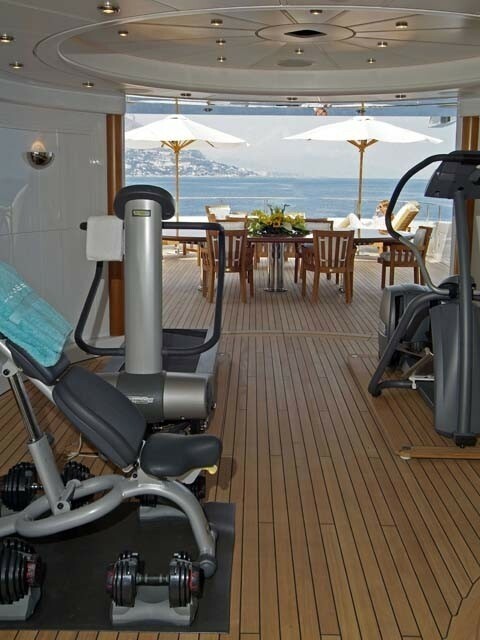 AV system is controlled via AMX touch panel screens which are available throughout the yacht. 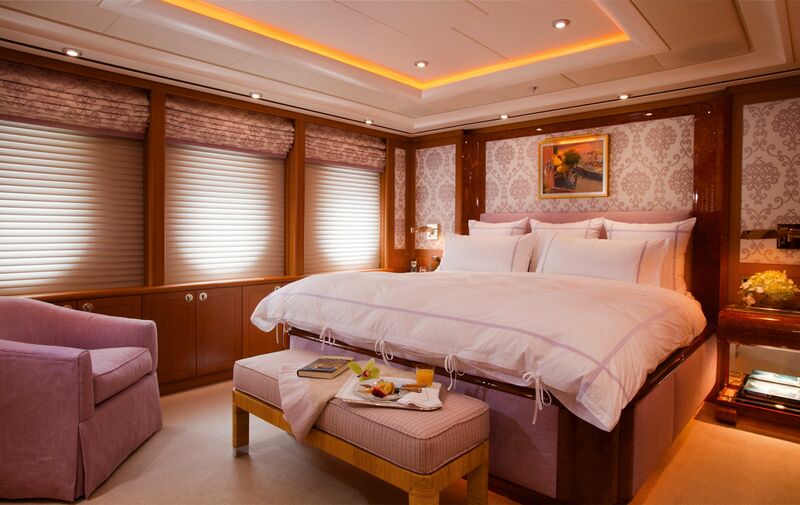 - Each stateroom / entertainment area has it’s own satellite receiver for DSTV - Music and Movies on demand - Disco with lighting & mood lighting on sundeck - IPOD interface, X-box, Playstation, and camcorder interface - Guest features include access to yacht’s ‘track & position’, Conning and CCTV - ‘Oasis Today’ gives access to activities, weather and menus Sundeck – Large area forward partially covered with overhead, incl. 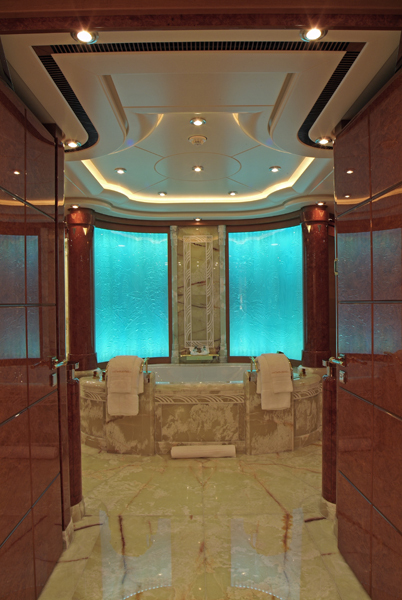 spa pool, open feature shower, bar and BBQ. 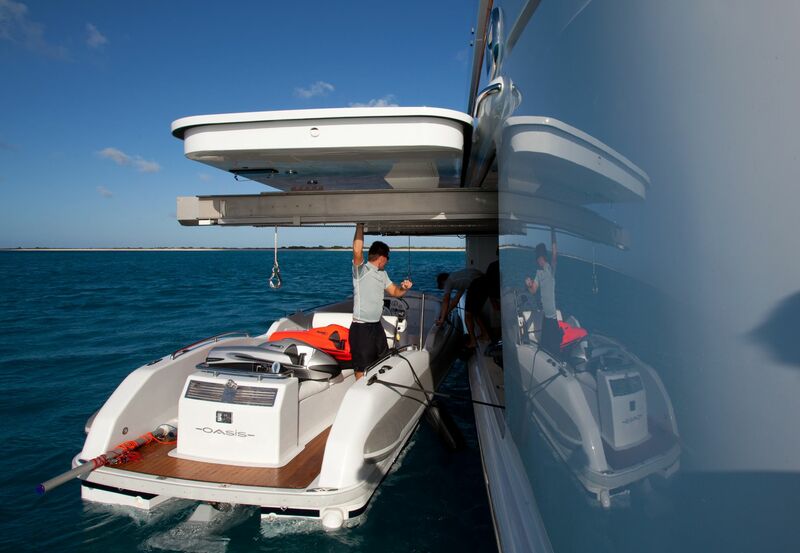 Full fair weather enclosure on centerline with 5.1 sound disco / gym, 42” drop down Plasma, powder room. 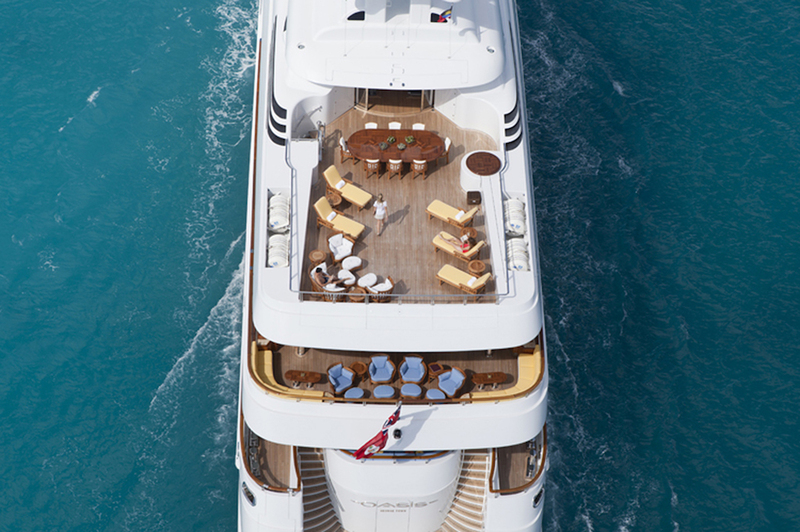 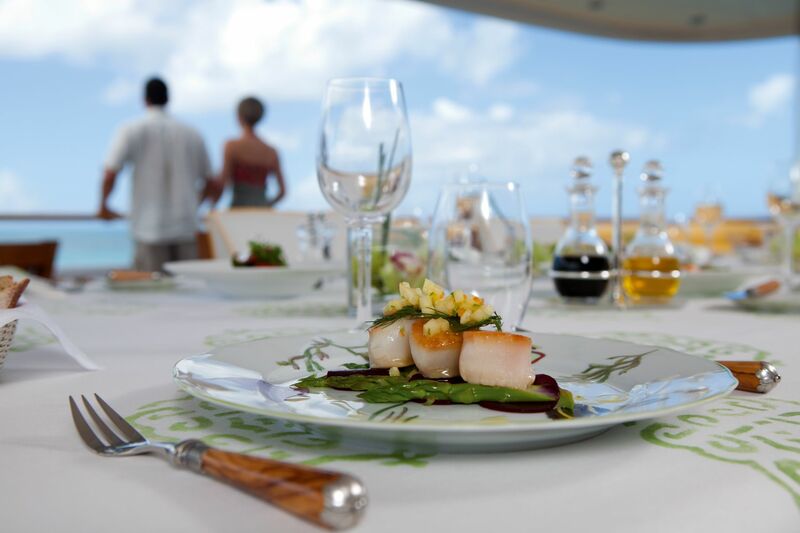 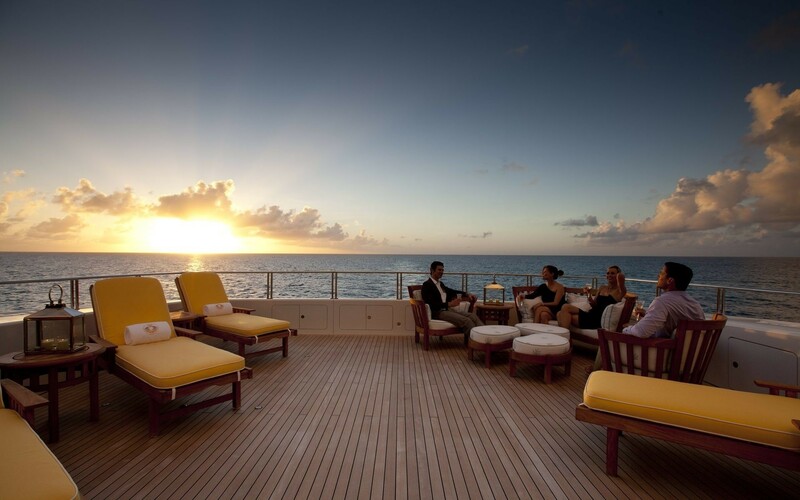 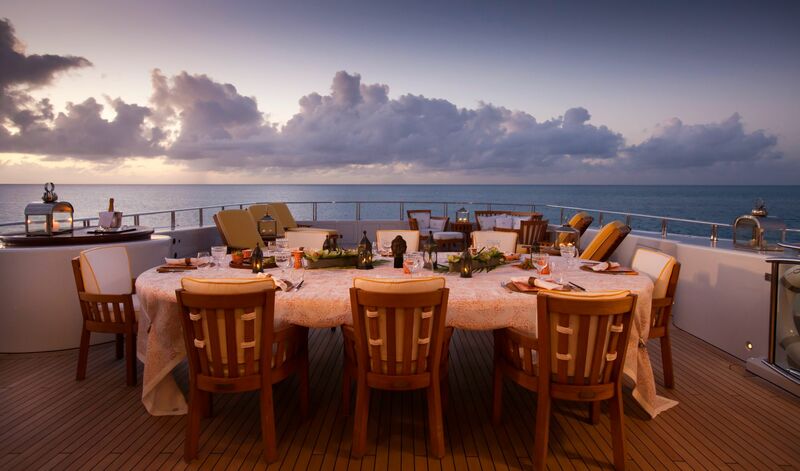 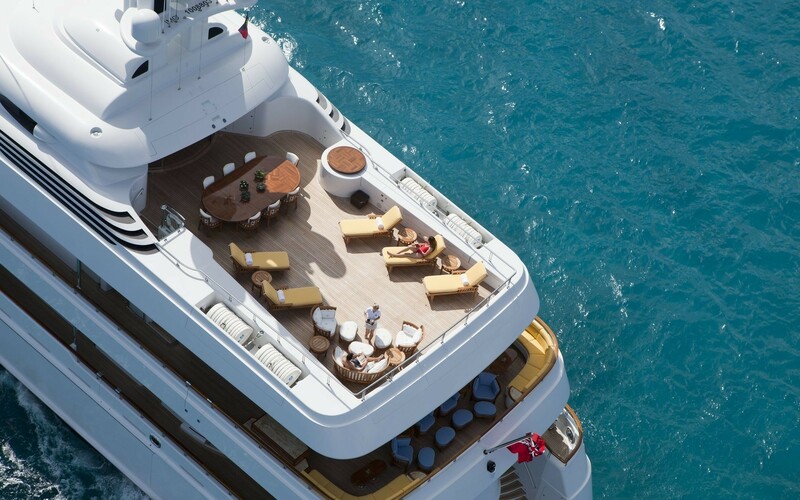 Aft sundeck features open, or covered dining with expansive sun-lounging space. 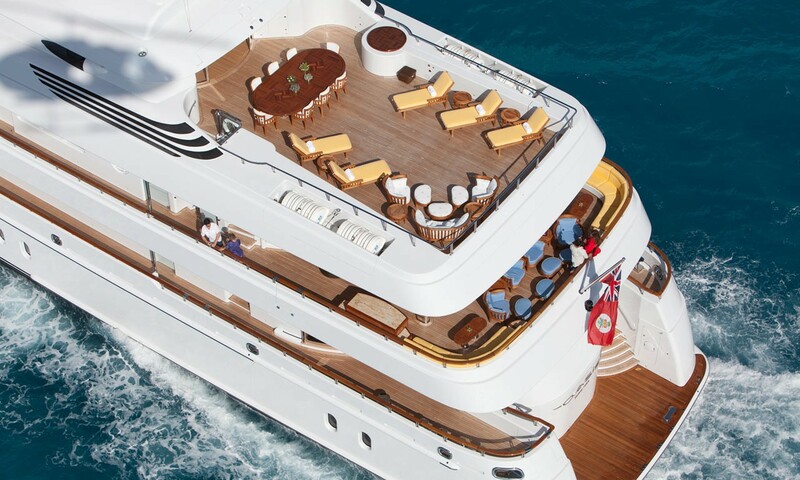 Upper Deck Aft – Covered table seating for 12, perimeter seating with cocktail tables, bar facilities. 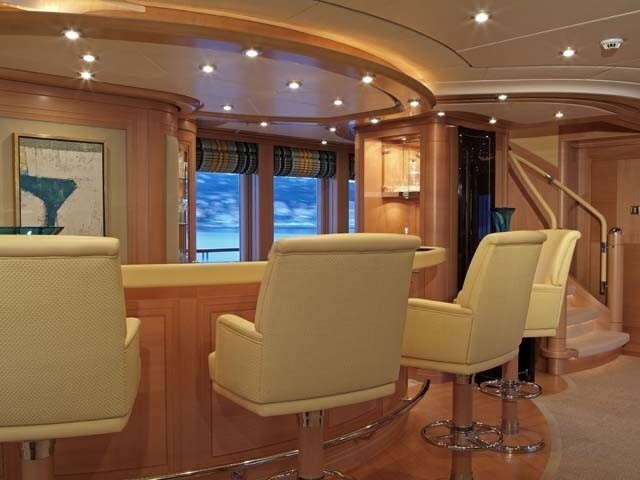 Upper Deck Skylounge – Two seating areas with large sofas, entertainment center with 5.1 sound & 60” Plasma, bar with seating, and powder room fwd. 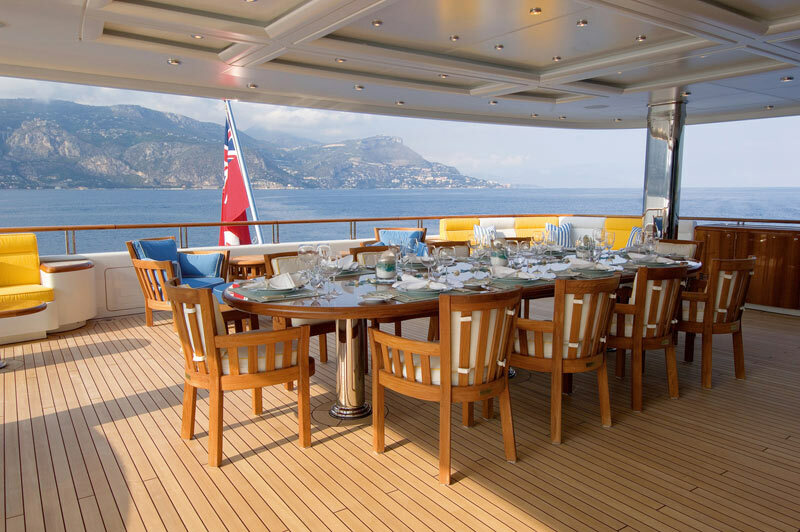 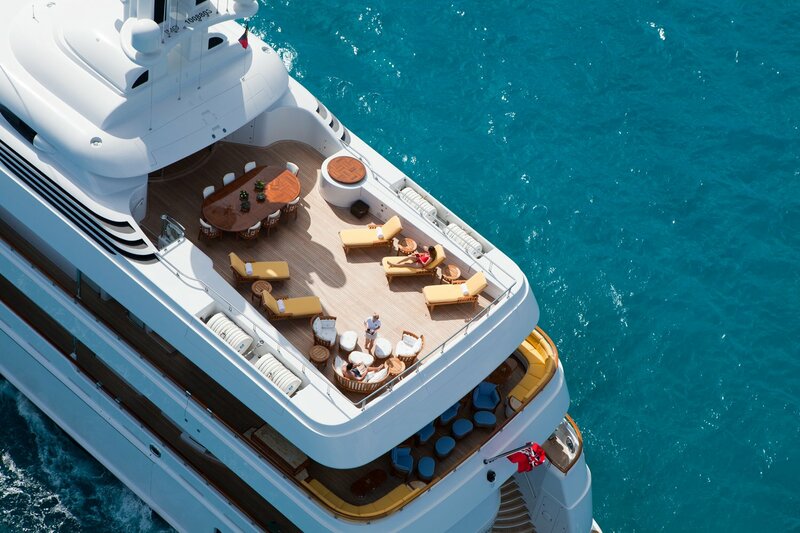 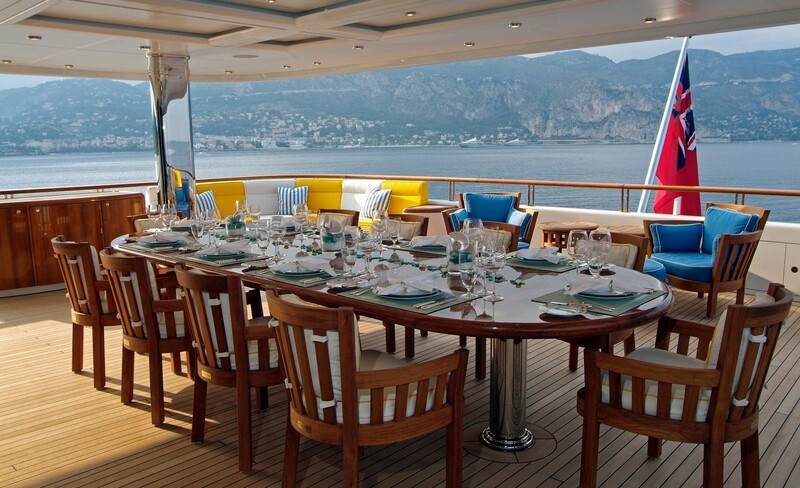 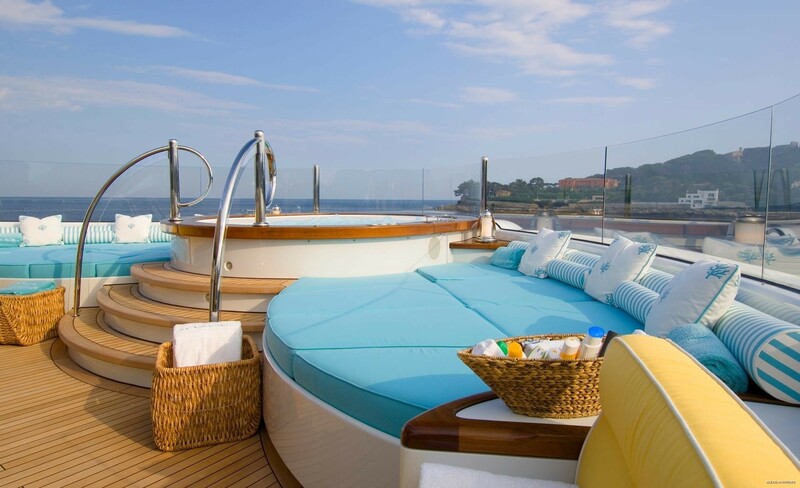 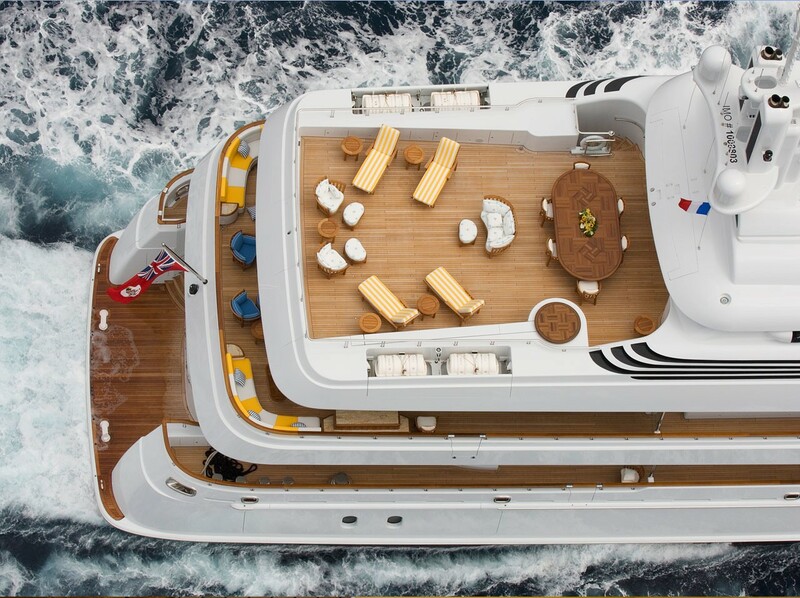 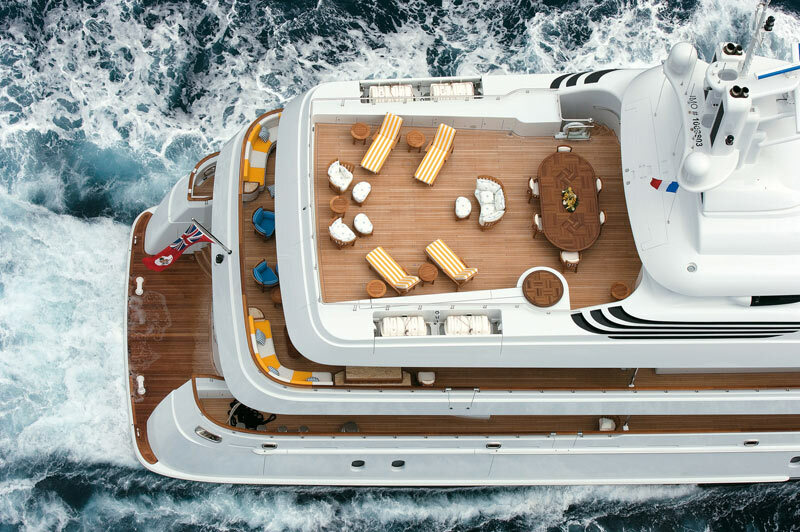 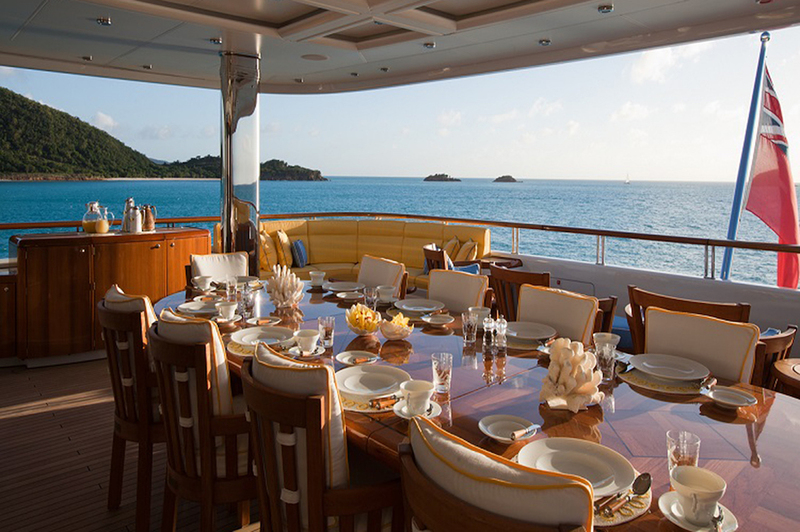 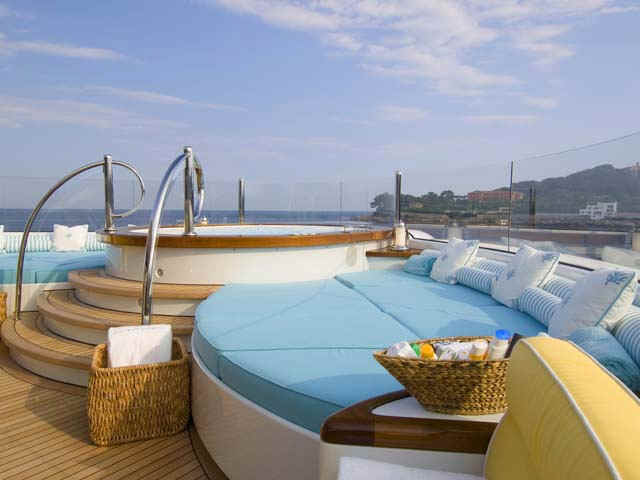 Main Deck Aft – Covered table seating for 8, access to swim platform and passerelle. 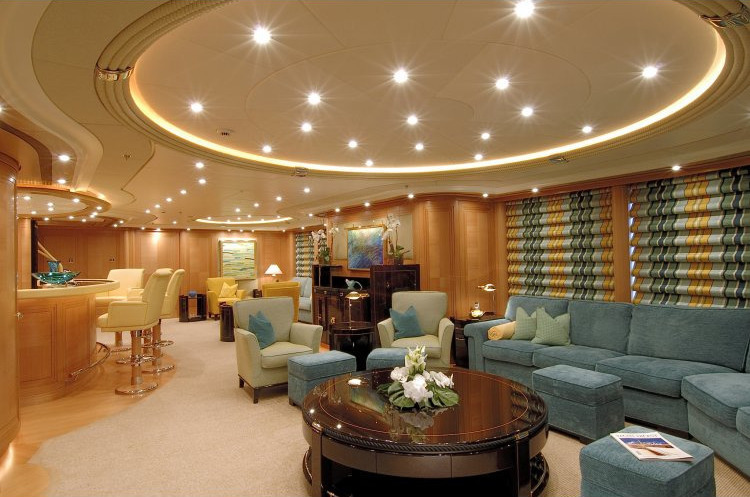 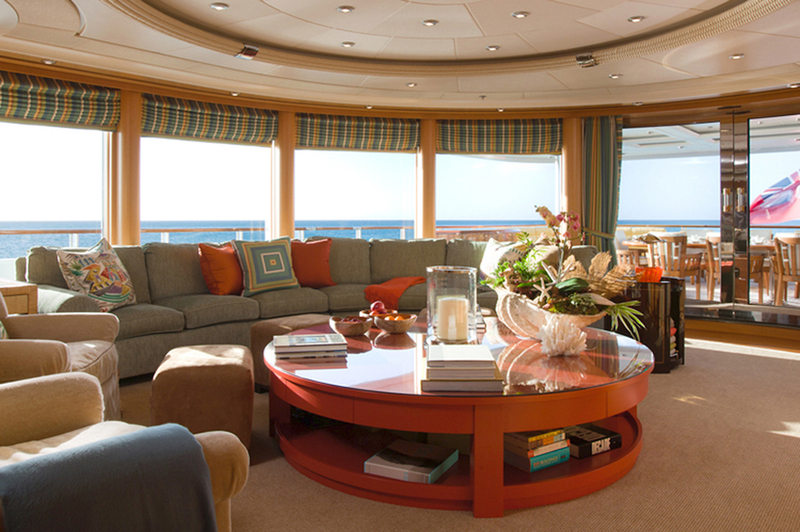 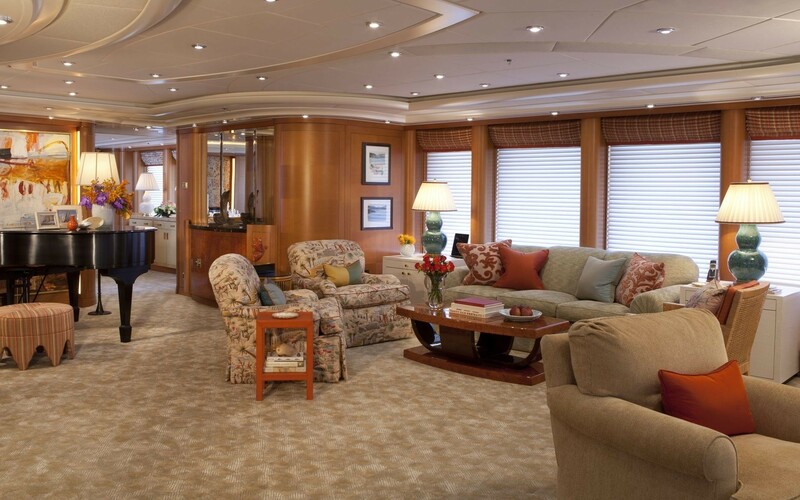 Main Deck Salon & Dining – Large sofa, games table, entertainment center with 5.1 sound and 60” Plasma. 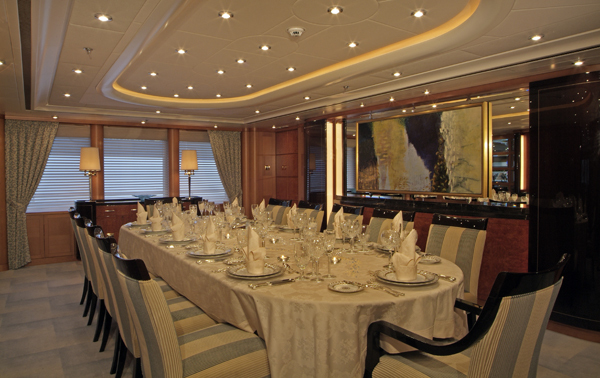 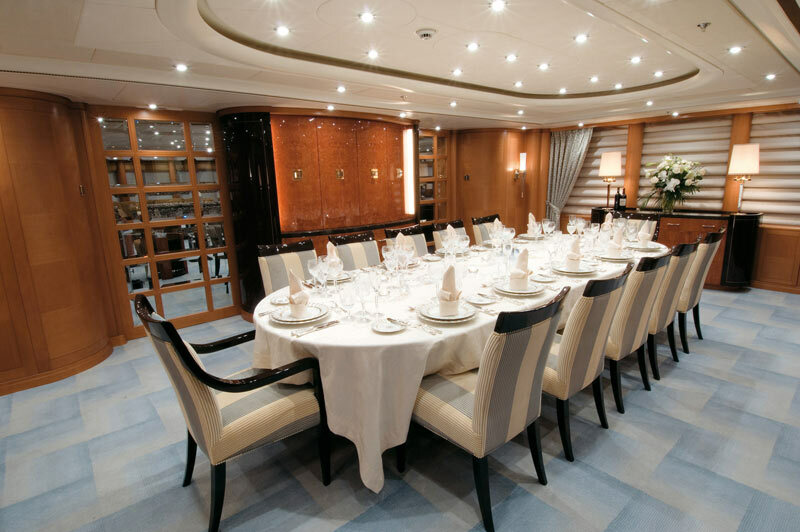 Formal dining room with seating for 12. 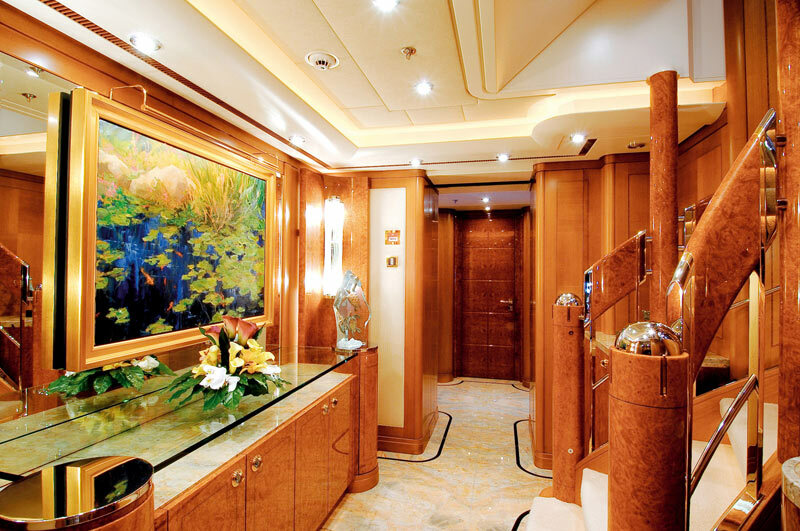 Powder room fwd. 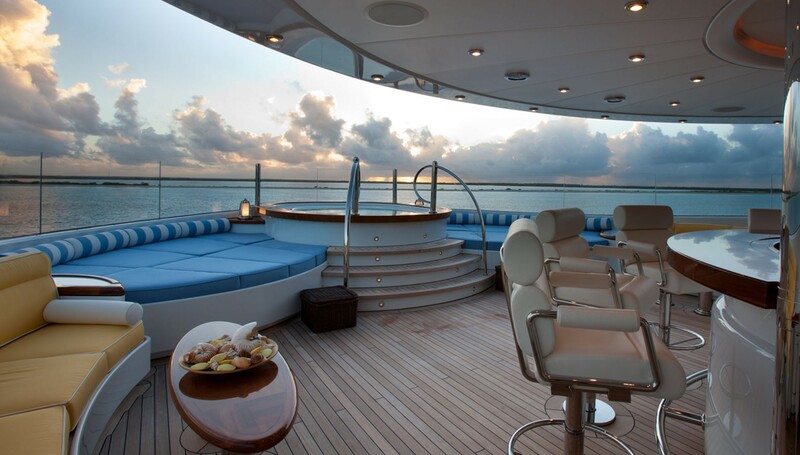 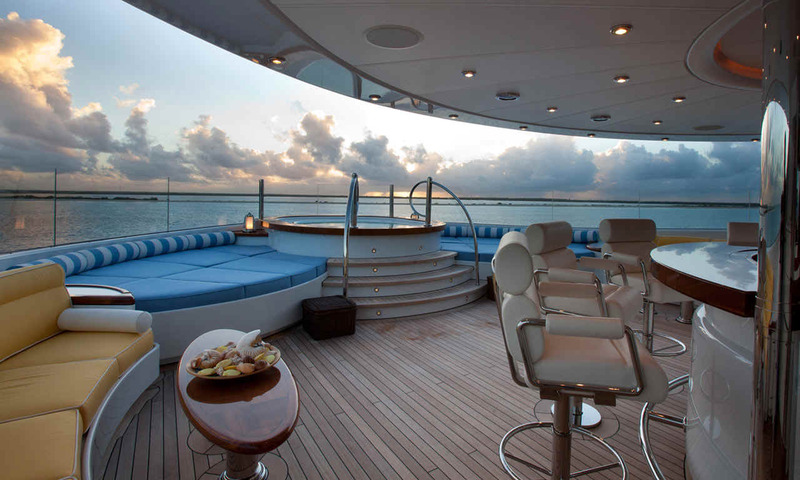 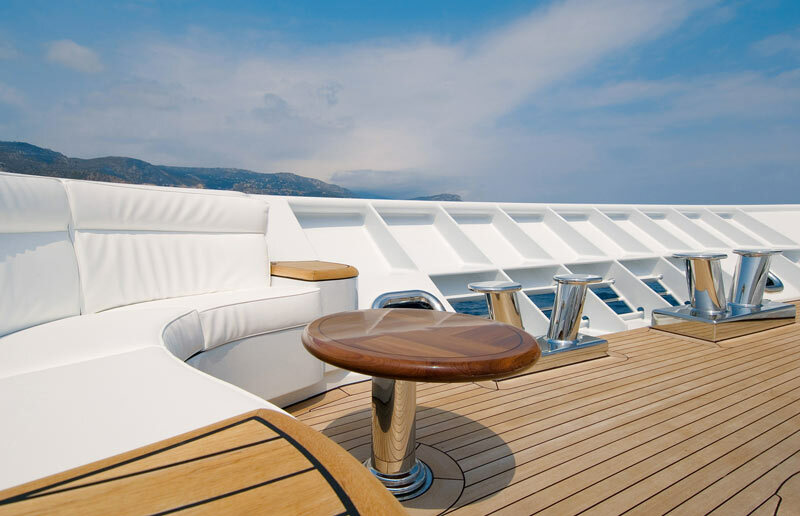 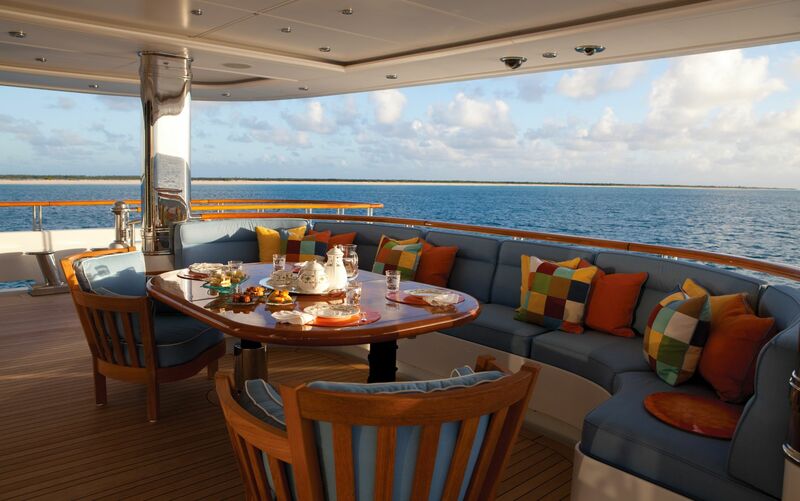 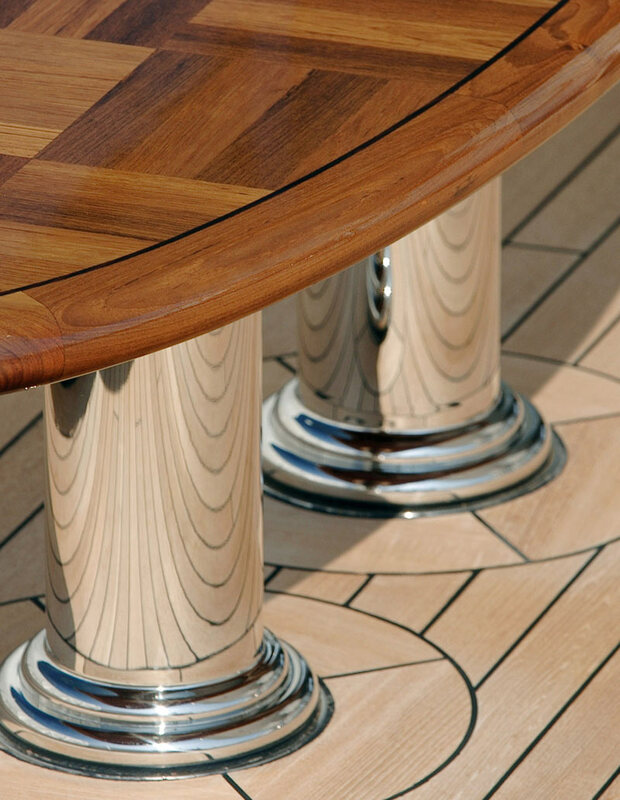 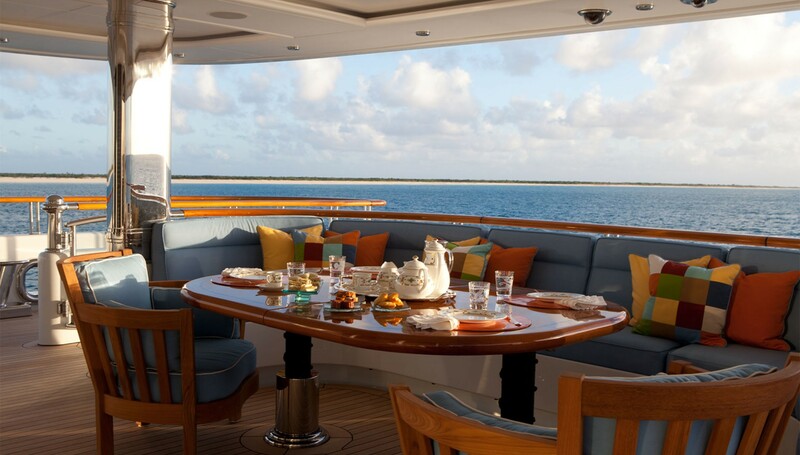 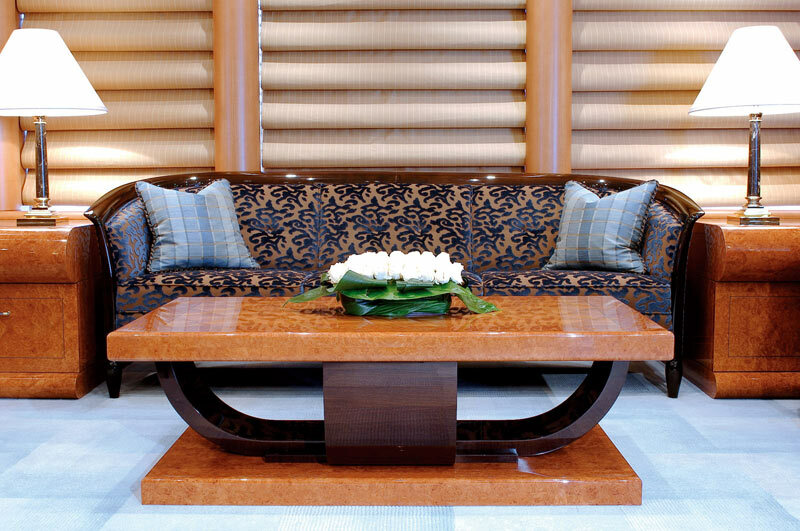 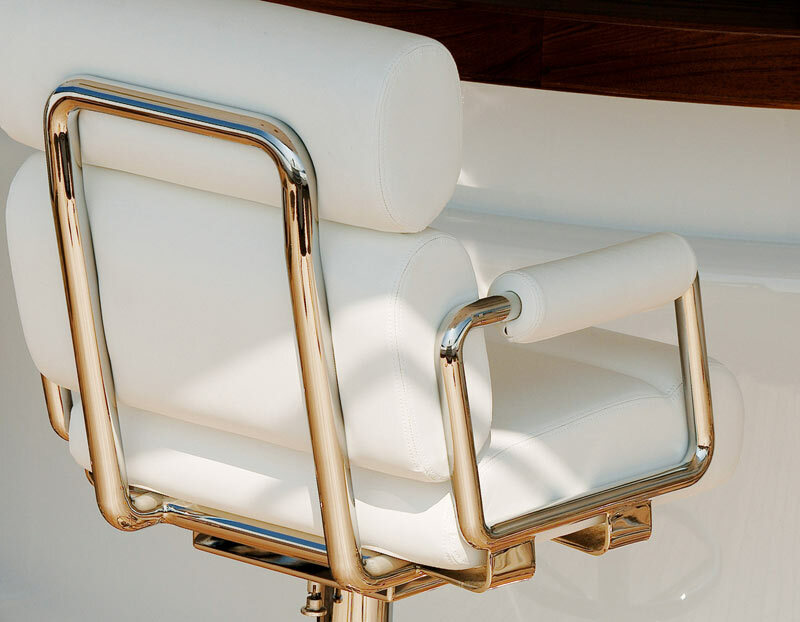 Foredeck – Seating area. 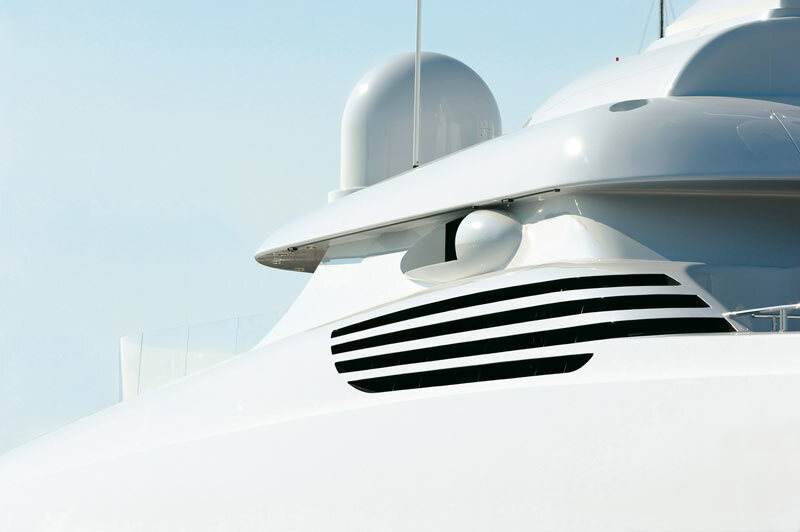 Communications VSAT antenna for voice and HSD – 512kb/128kb F77, F33, 2 x GSM terminals Voice, HSD (ethernet and wireless) throughout yacht Mitel telephone exchange Fax 3 x VHF radio terminals SSB, Sat C NewspaperDirect – print on demand daily newspapers available. 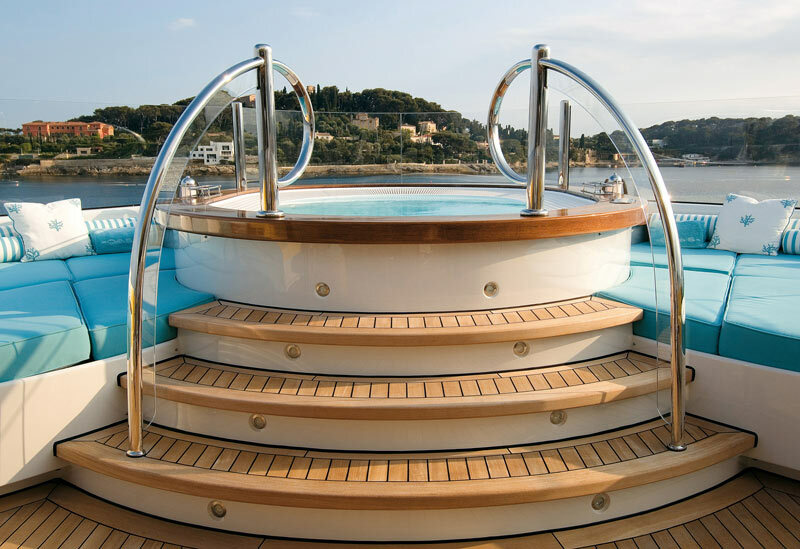 Oasis is equipped with Zero Speed Stabilizers. 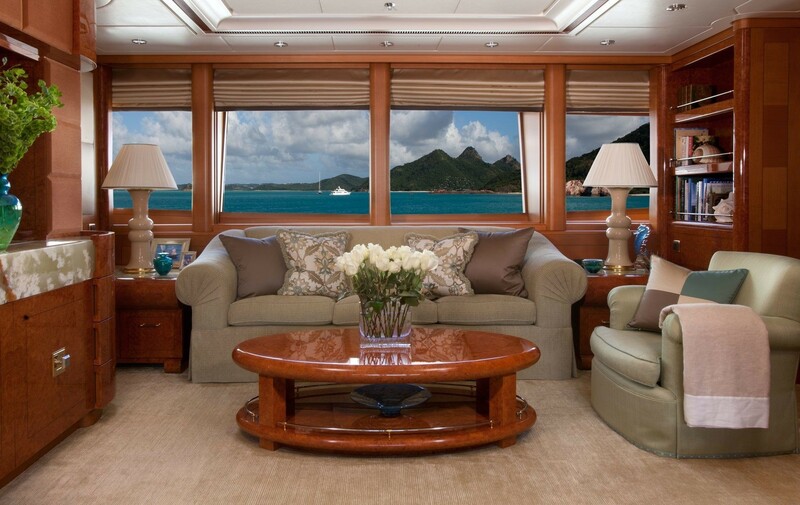 Dear Amanda, We had a great time and I think all aboard were very happy with the trip. 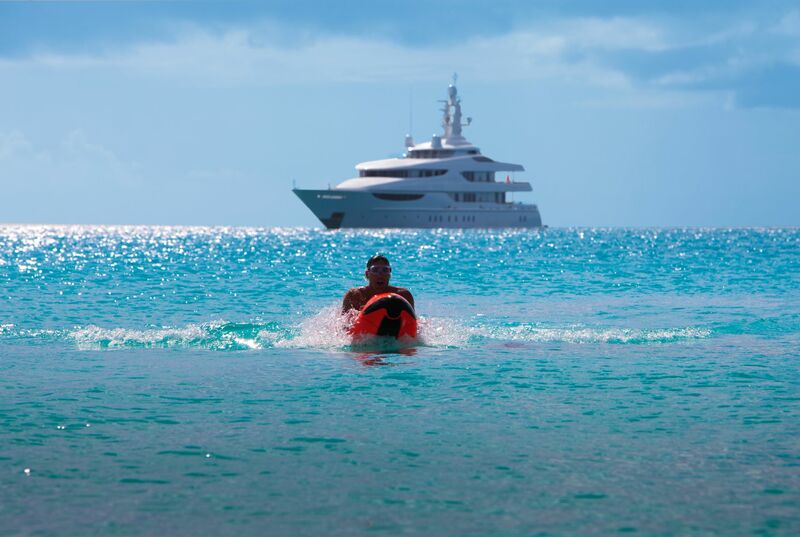 We stayed the first night at White Bay on Jost and since the weather was not so good that night we moved around and stayed in Great Harbor. 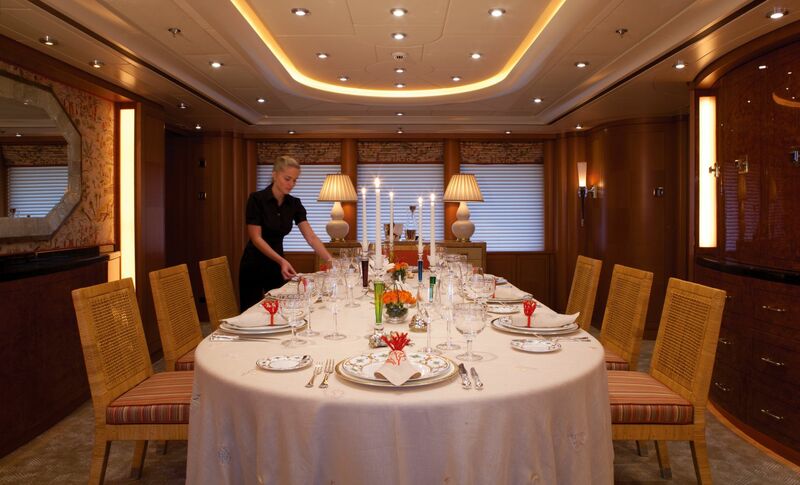 All meals were aboard and the cooking and menus were awesome. 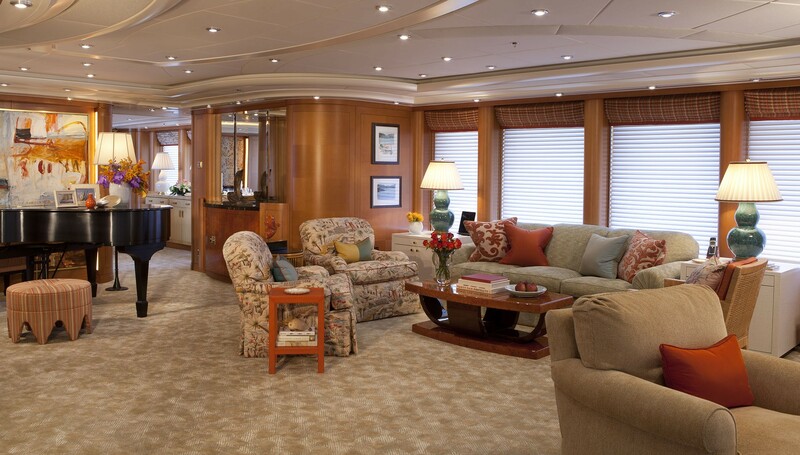 Captain Jeff had some great sea stories and the Mate Linda was very sweet and charming. 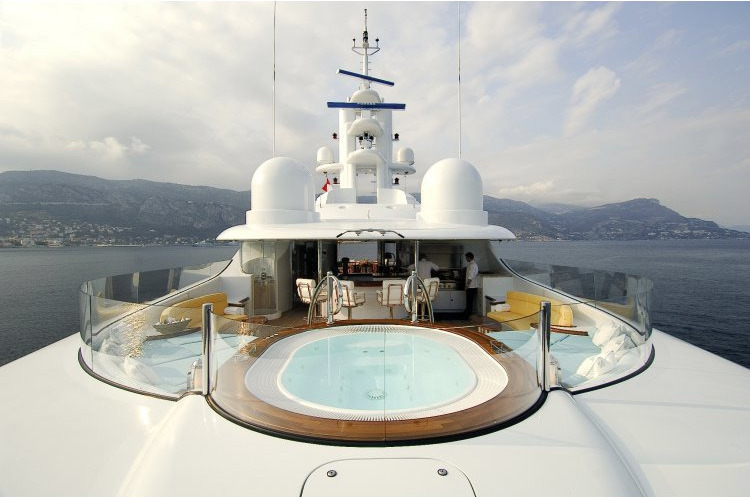 The idea of not worrying about anchoring and where to overnight worked out well. 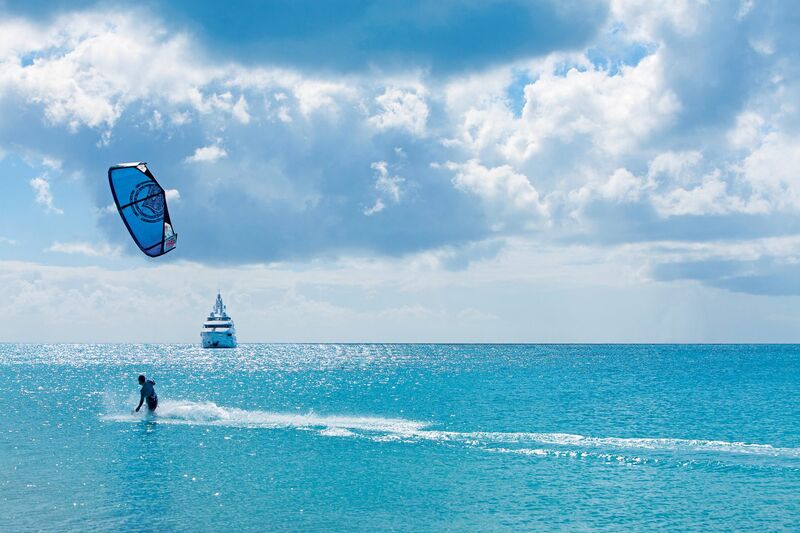 Big thumbs up for the trip. OG, chartered GRAND OASIS in BVI, April.